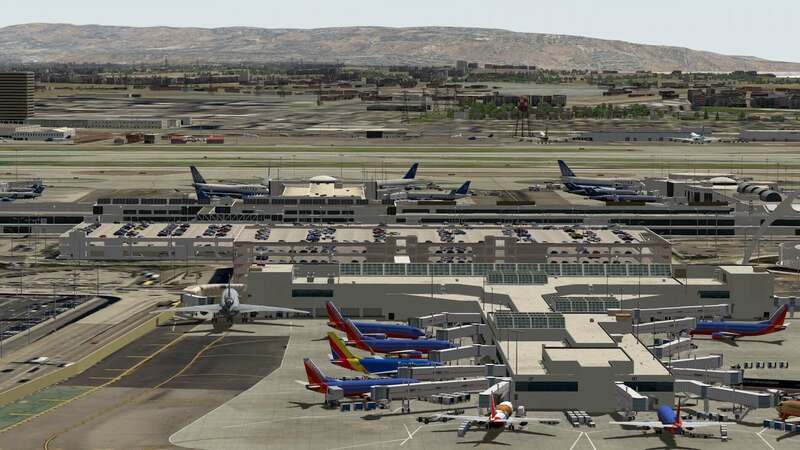 Jeff Mueller – FunnerFlight has been creating sceneries in X-Plane for some years now. 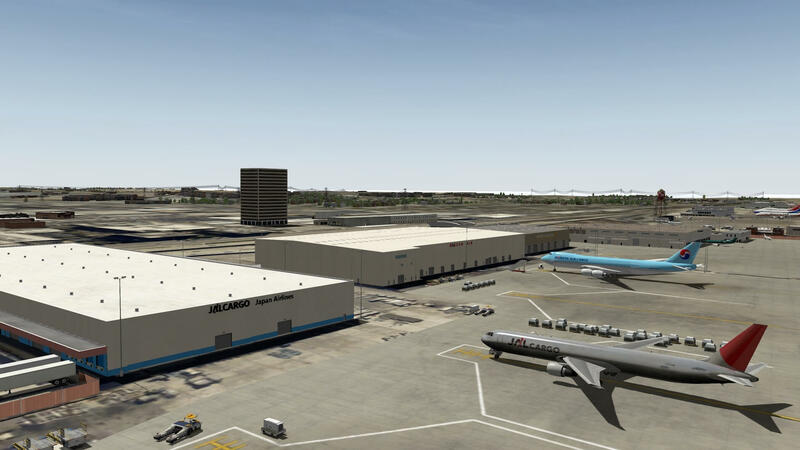 He released KJFK v2 in April 2015 and now KLAX v2 is his latest offering. 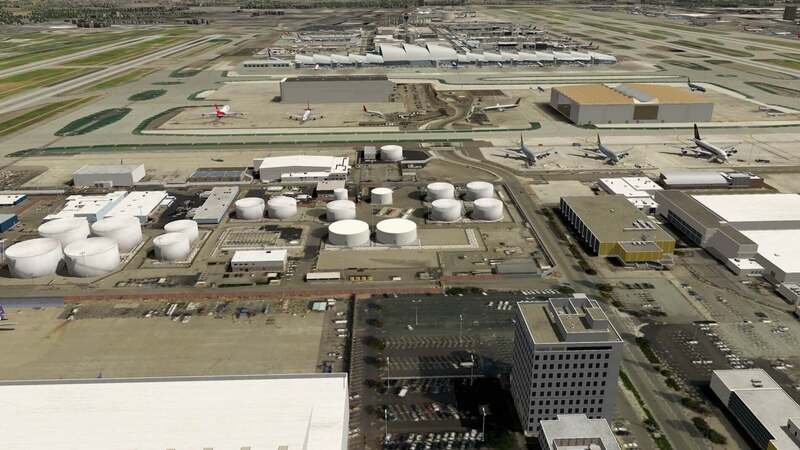 Let’s hope he’s going to join the dots and add some mid-west airports too! 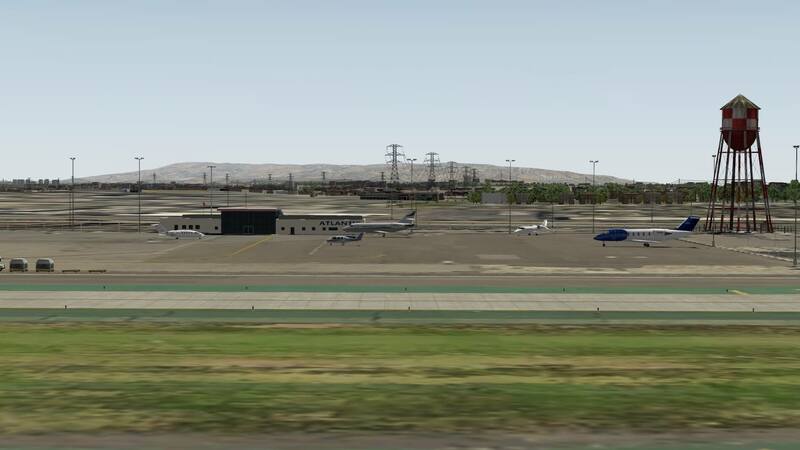 First opened in 1930, Mines Field, changed it’s name to Los Angeles Airport in 1941, then changed to Los Angeles International airport in 1949. 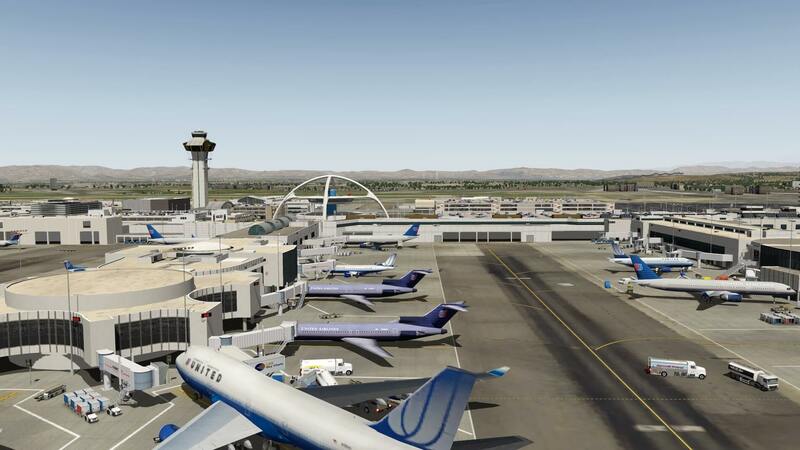 In the 1060’s the nearby Burbank airlines’ residents moved to LAX for their permanent home, namely American, Pan AM, Trans World Airlines, United and Western airlines. 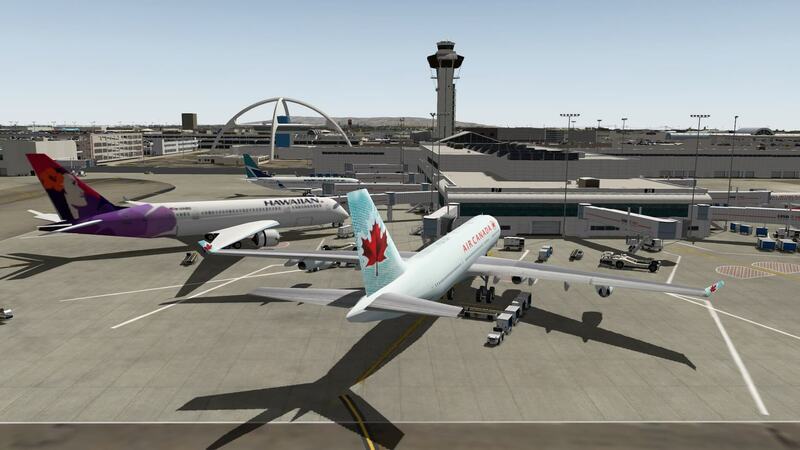 This was the start of the Jet-Age in LAX. 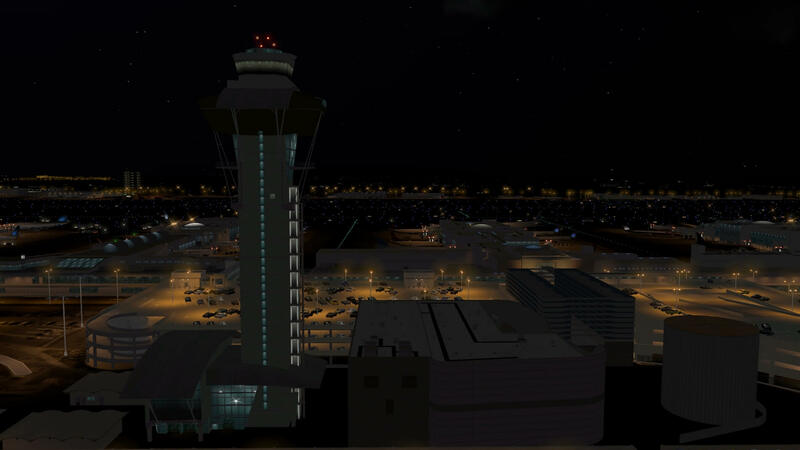 It was also at this time, that the famous Theme Building along with the new control-tower was built. 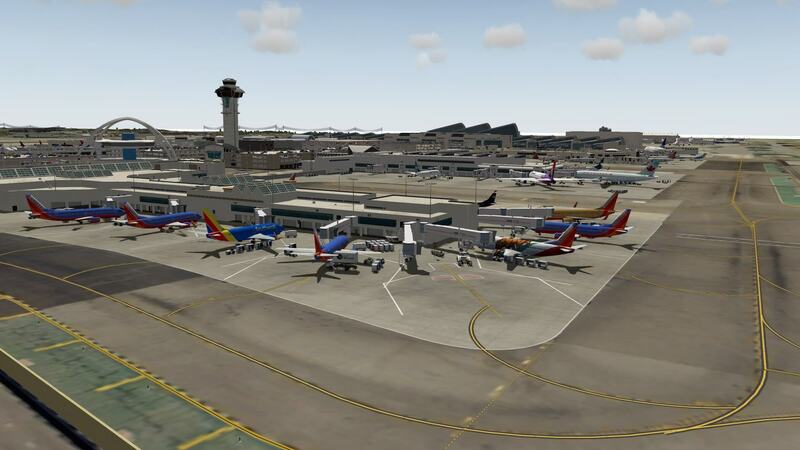 There are over 70 passenger airlines using KLAX at the moment, and over 30 freight airlines. 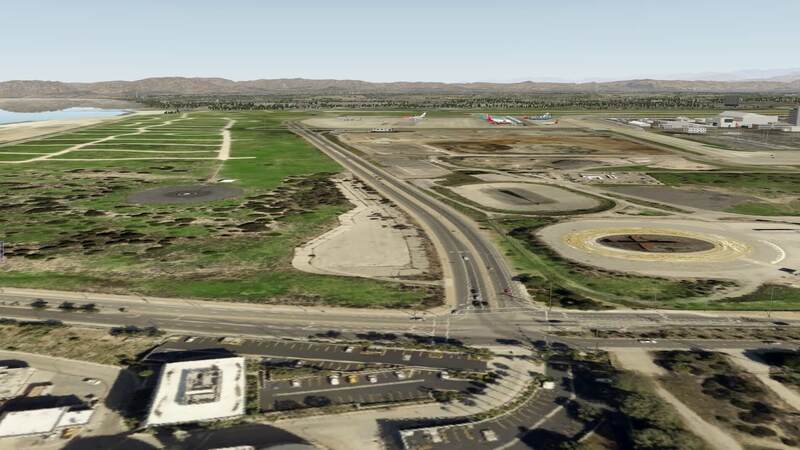 This alone will tell you this is a major airport. 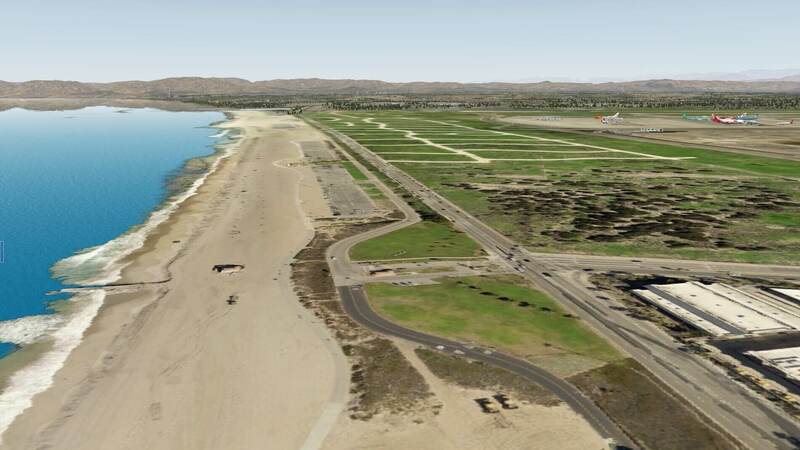 There are four parallel runways, consisting of the following attributes. 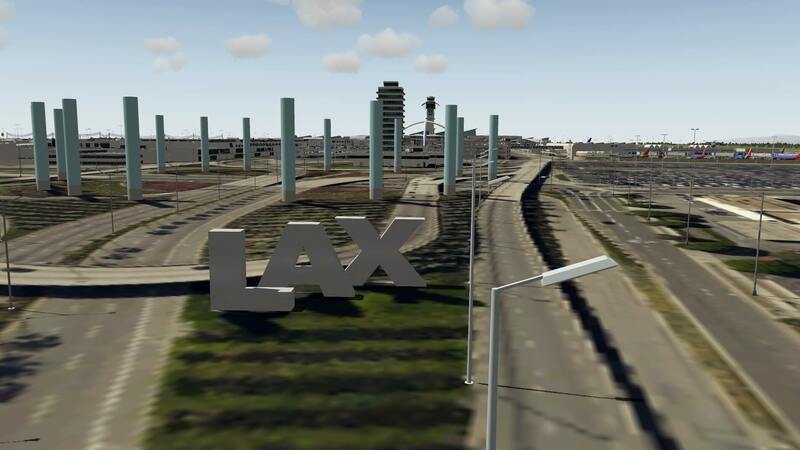 KLAX has a total of 9 terminals, with numbers 1 -8 facing away from each other, and the ninth terminal (known as Tom Bradley International Terminal) facing towards the west. 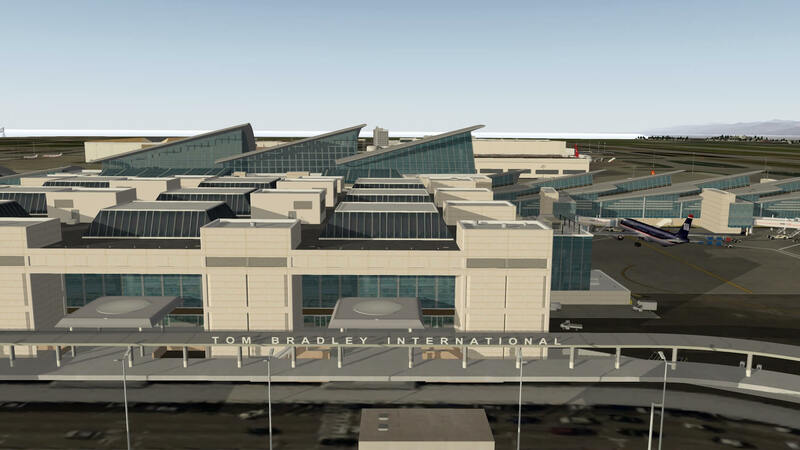 Probably the most recognizable part of this airport, is the Theme Building which is a U.F.O type structure roughly between terminals 1,2 6.7. Alongside this is the Bob Hope Hollywood United Service Organizations Center. 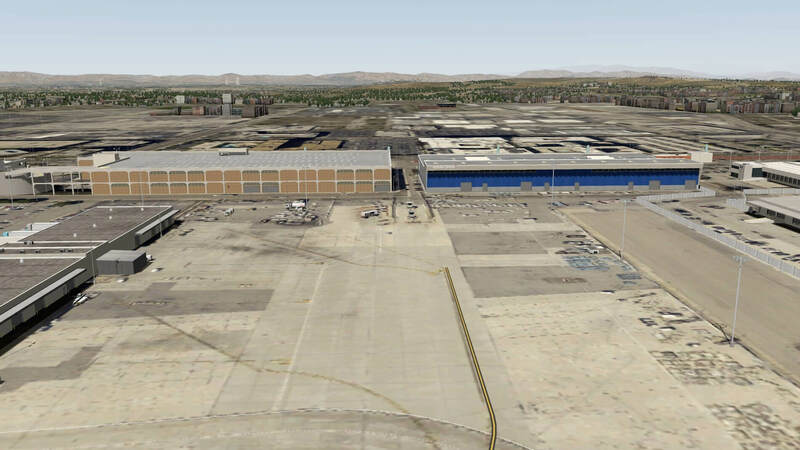 It’s also one of the 35 or so airports in the US which support ASDE-X, which can track ground movement of the aircraft once it’s landed for better safety. 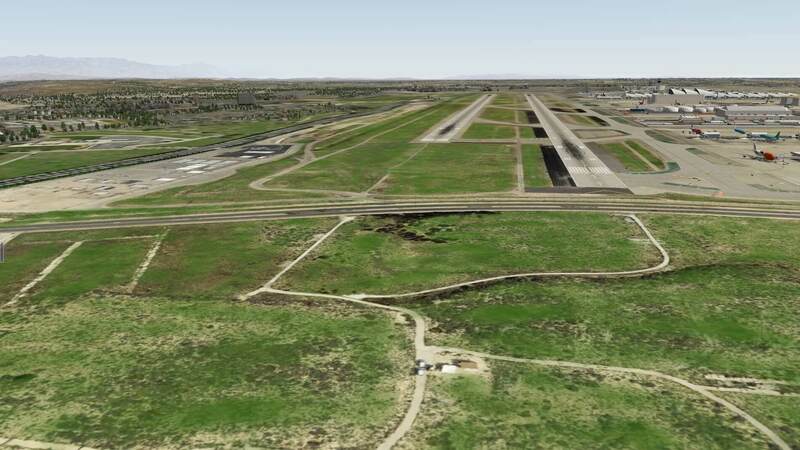 This facility requires leaving the transponder one once landed. 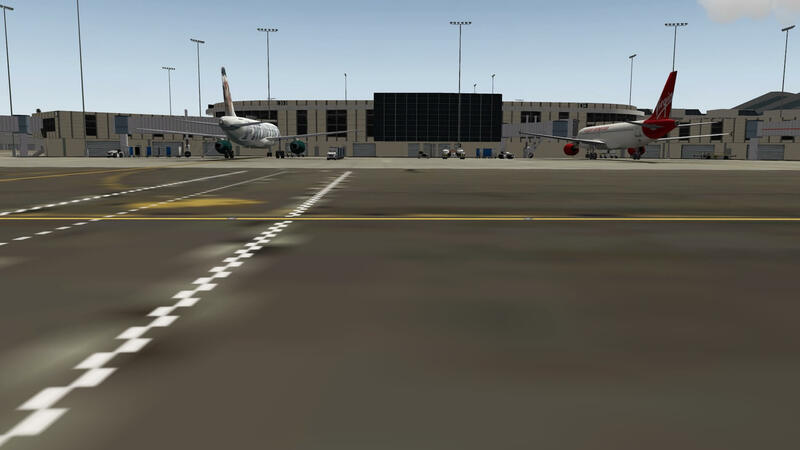 From the X-Plane.org, the following features are listed in the KLAX package. 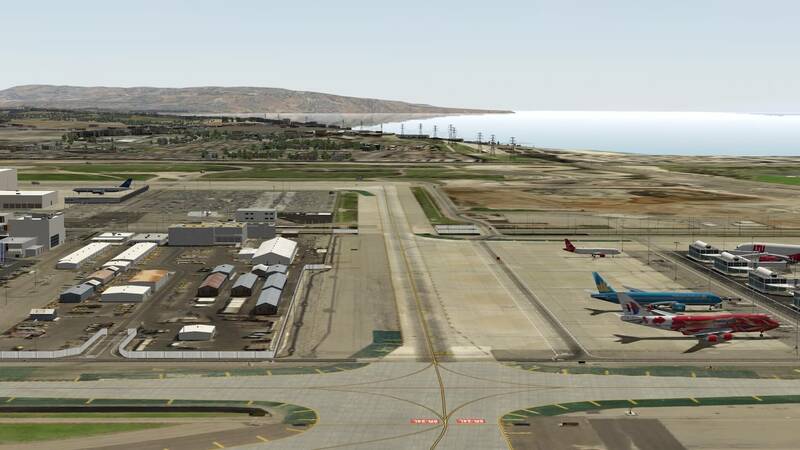 – ATC taxi routes and 4 runways with Wind rules. 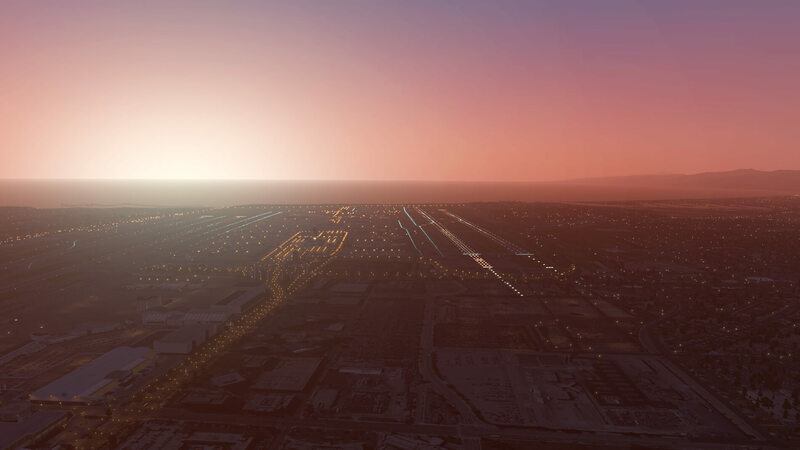 – Over 100 Animations, most using Ground Traffic by Marginal. System requirements are quite high, but most systems today should be able to handle this workload. 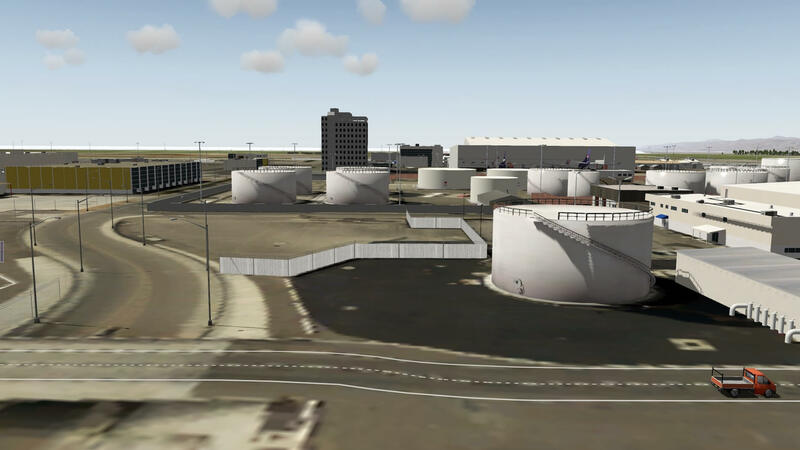 This package also requires OpenSceneryX which is freely available from the OpenScenery site. 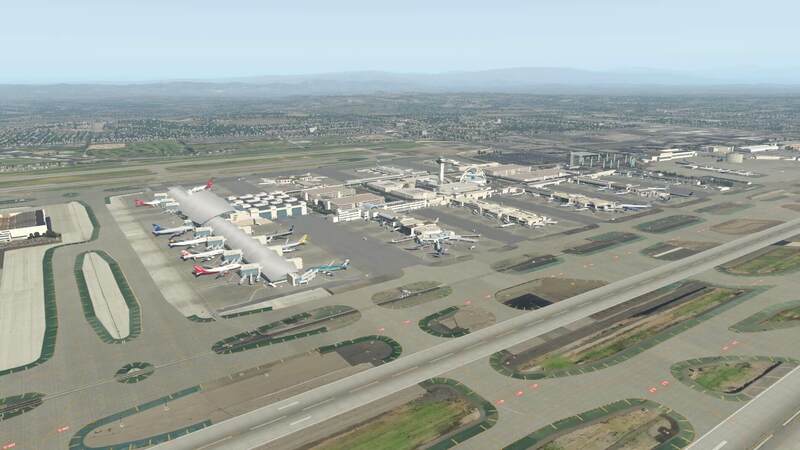 Installation of sceneries in X-Plane is generally straightforward and usually follows the process of unzipping and placing the extracted scenery folder and placing it into the “Custom Scenery” location inside the X-Plane folder. 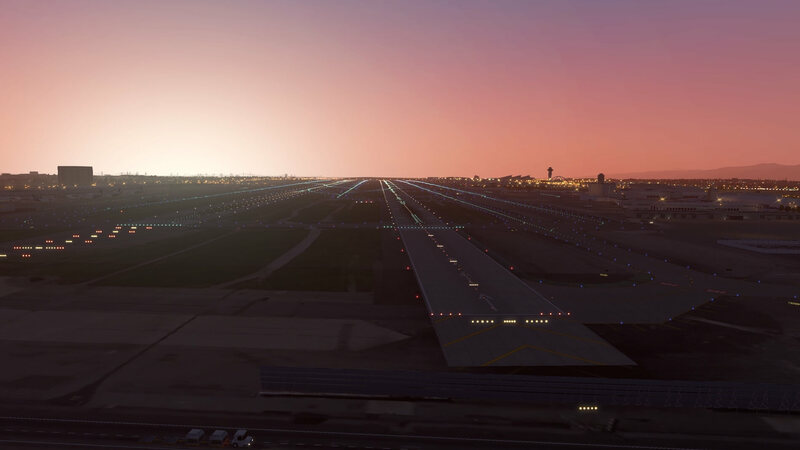 On some occasions, you may have to adjust the scenery.ini text file to change the order of some reference files, but in this case, there is only one folder, so a simple restart of X-Plane, should allow your newly added scenery to be visible in all it’s glory. From the read-me file (Important! 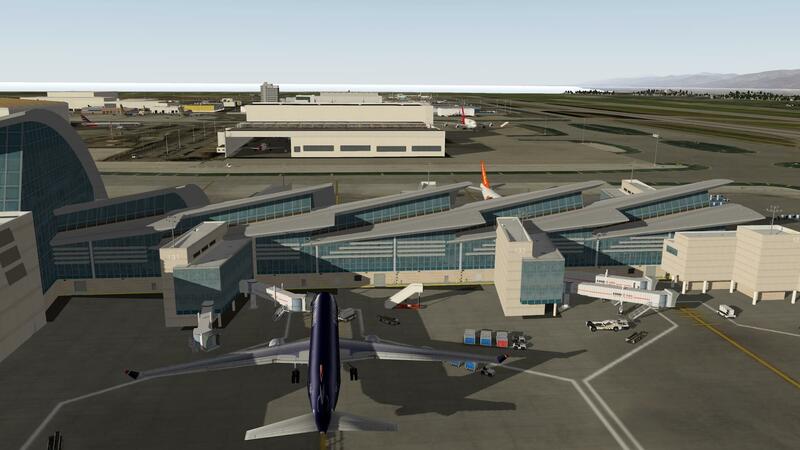 ), it gives the instructions on how to install the airport. 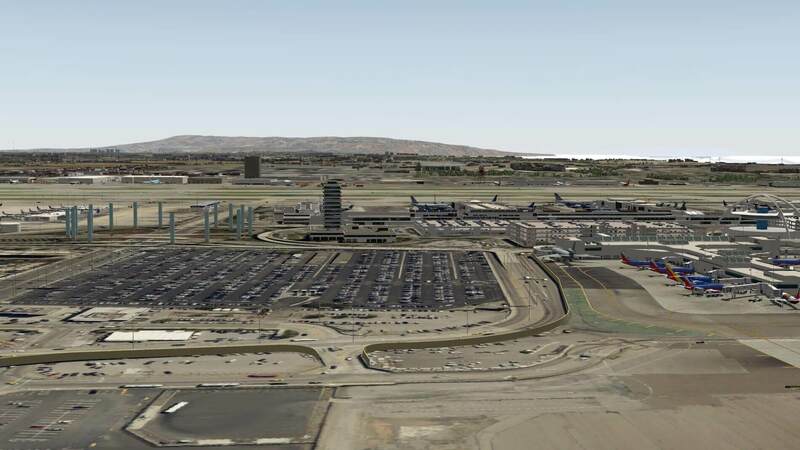 There are only 3 things you need to do to see the airport in action. 1. 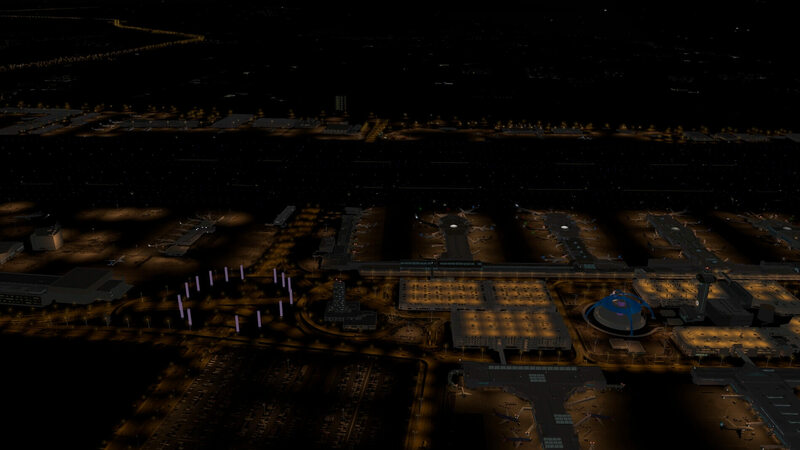 Unzip the KLAX folder and place into Custom Scenery. 4. 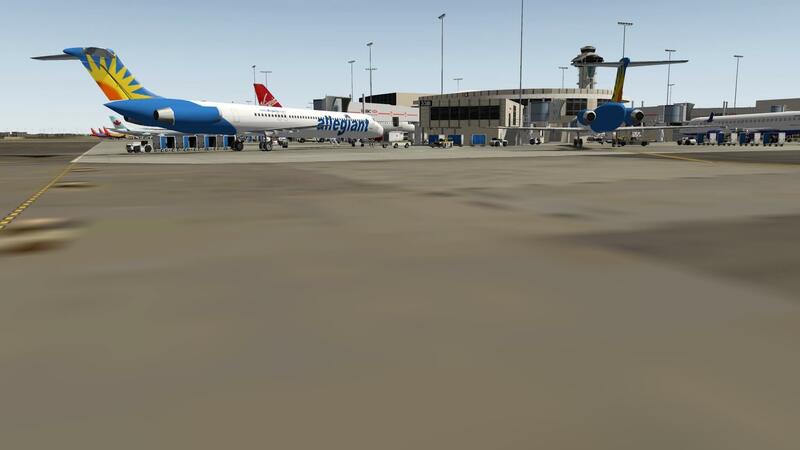 Click the “Download this file” button, and download the “Aircraft-Static_and_Animated” file. 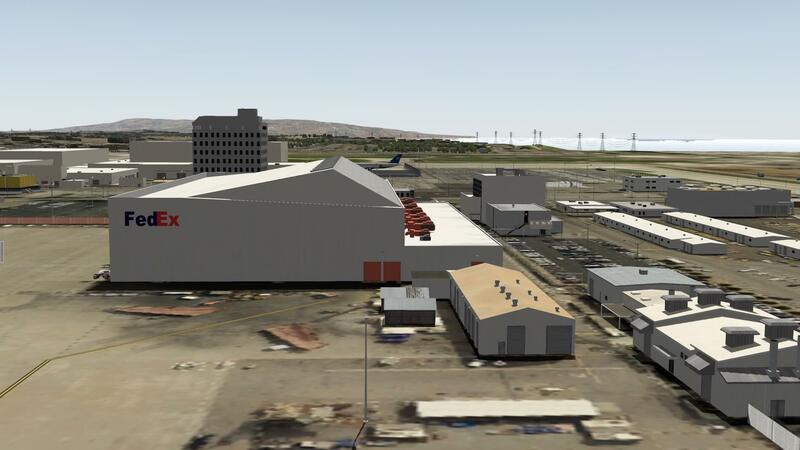 Unzip and place into your Custom Scenery folder. The instructions above are for the quick-start guide, but this airport has more. Inside the main folder, are 3 more options which can be availed of. 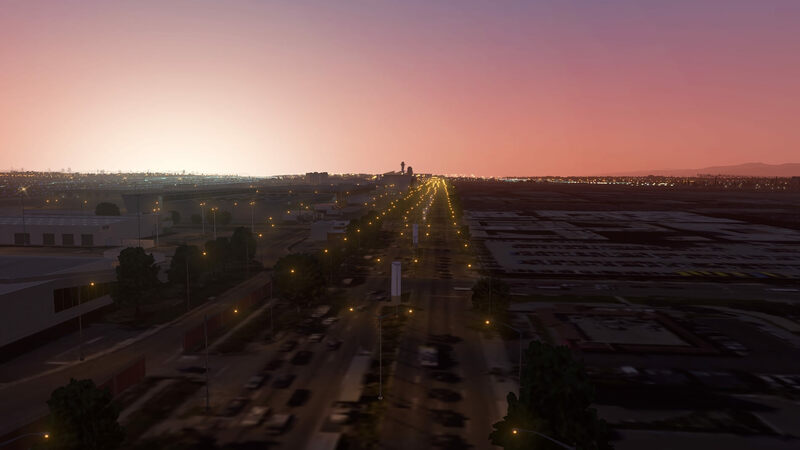 Greener grass and newer asphalt option gives a brighter green and darker roads option than the original files -, personally I prefer the original option. 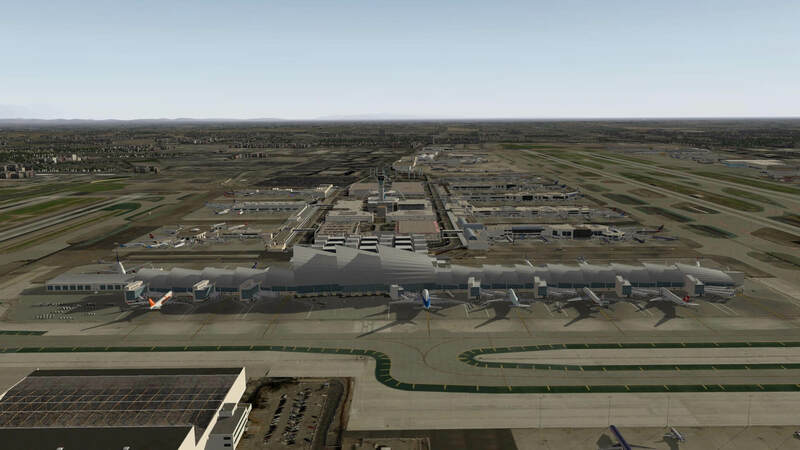 OK, this is a big, and I mean BIG airport. 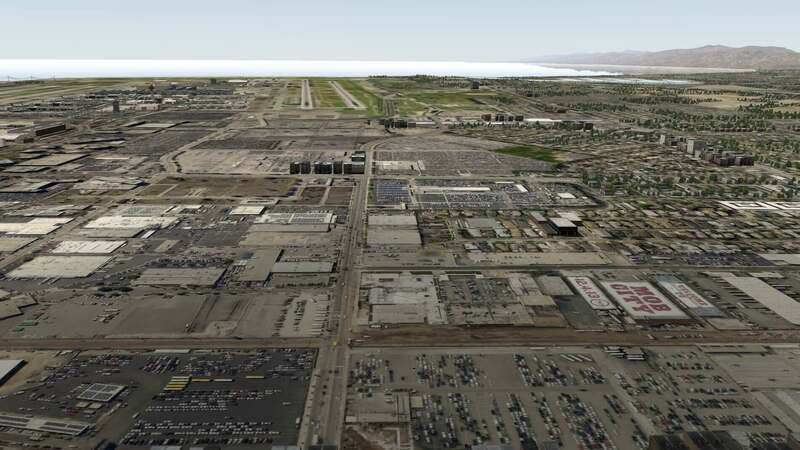 It’s about 5.5 sq miles, (8 sq km) of land, so yes, this is large, even by U.S standards. 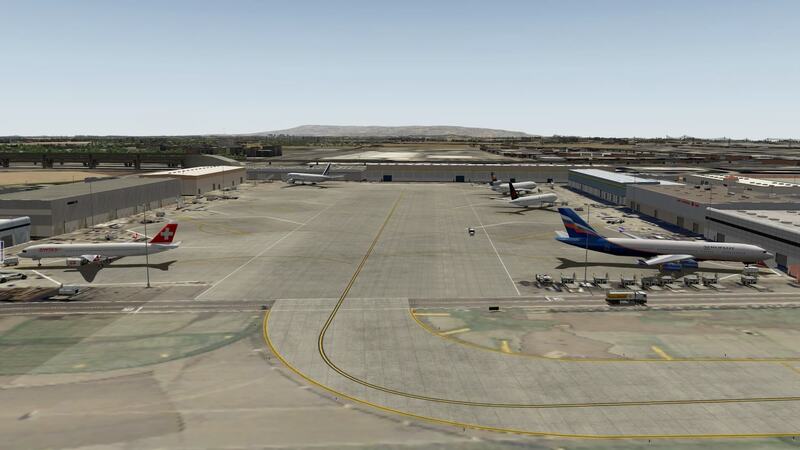 Even taxiing to the gate in X-Plane takes some considerable time. 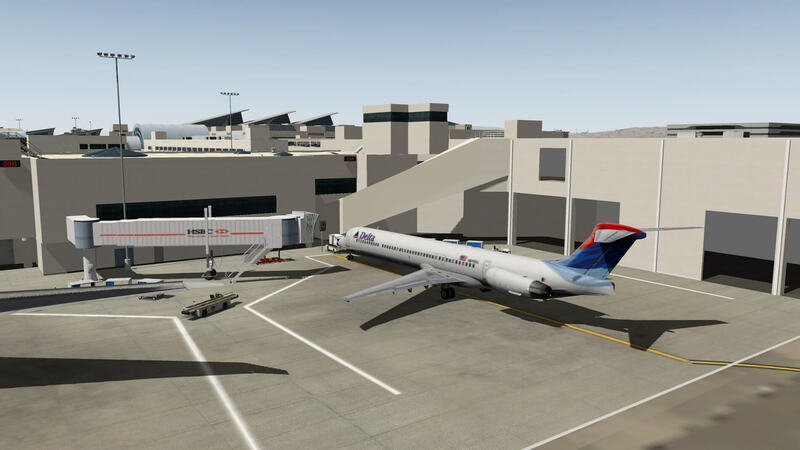 For frame-heavy aircraft like the Rotate MD80, but for the IXEG, the framerate is about acceptable, although it does take about 10 fps more than other large airports such as Heathrow, although having said that, there is a lot more eye candy and the scenery has many photo-realistic textures present than in any other scenery I’ve used so far. 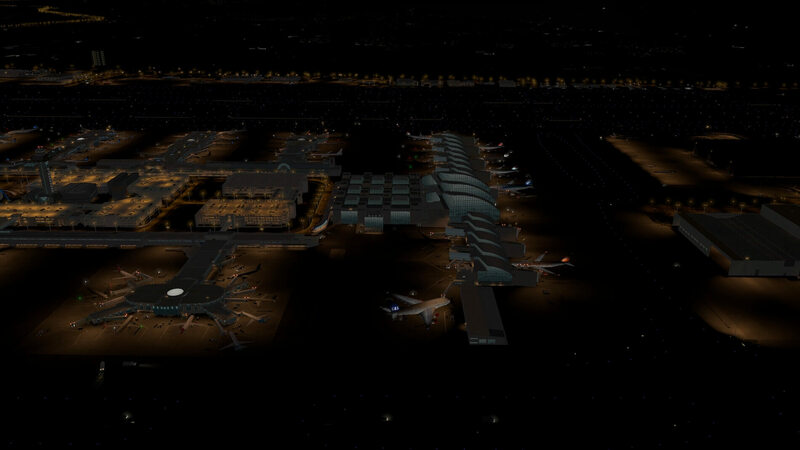 This is perfectly understandable considering both the size and sheer amount of objects in the airport. 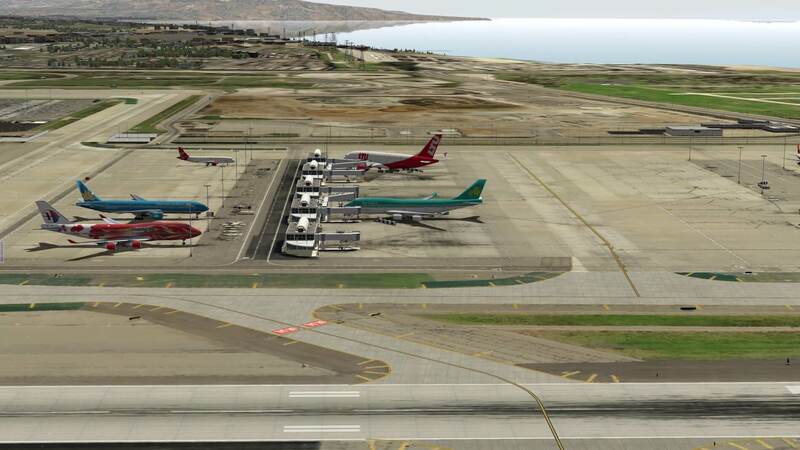 The addon aircraft do give the impression of a very very busy airport indeed, although there are a few oddities here like some Germanwings B747’s that I don’t think exist in real-life. 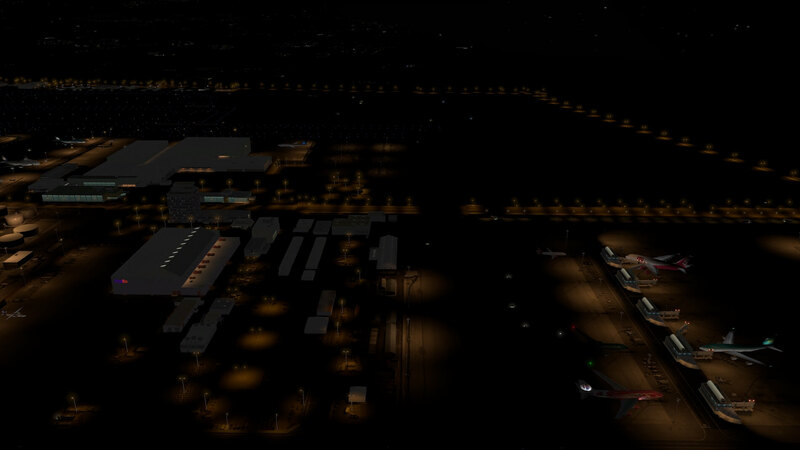 In the end, I lowered my rendering settings to “Very High” instead of “Extreme”, and in this case, it gave me a much more fluid experience, so in this case I would recommend this setting for this airport. I was getting 40 fps and higher once I’d set this value. 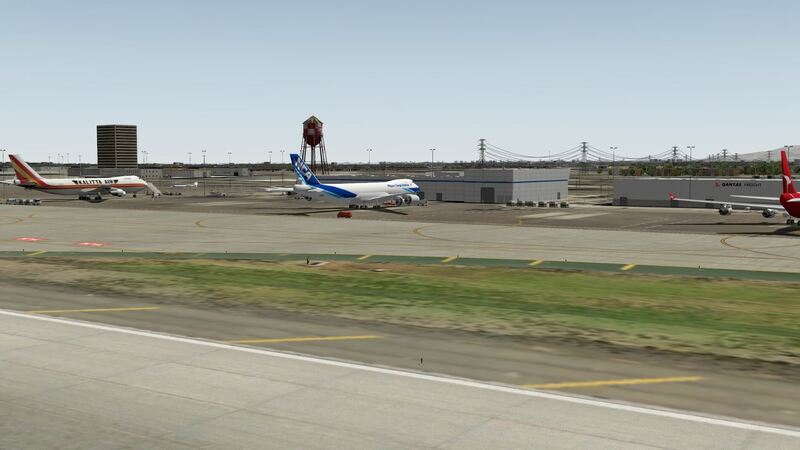 This time, I thought, since it’s such a large airport, I thought it would be best to review from right to left direction, – from 25L and 25R viewpoint, then back again. 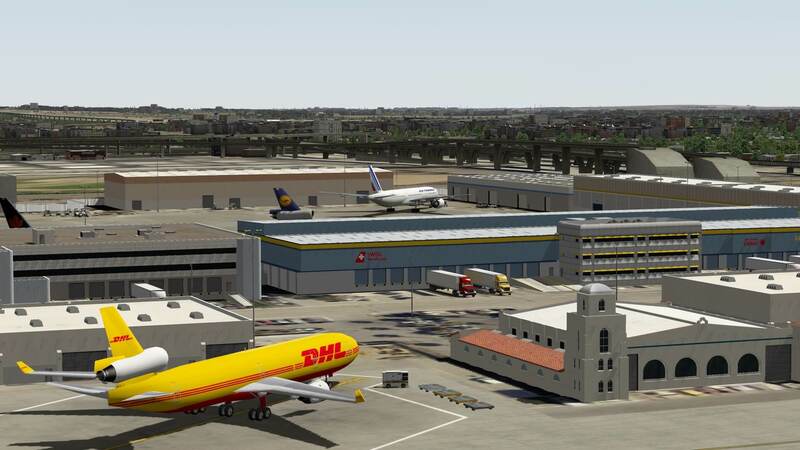 Starting at the Imperial Cargo Complex, which is a 58 acre site which accommodates such cargo airlines as Lufthansa, Japan Airlines, Korean Air, Federal Express, China Airlines, Delta, and Air Canada. 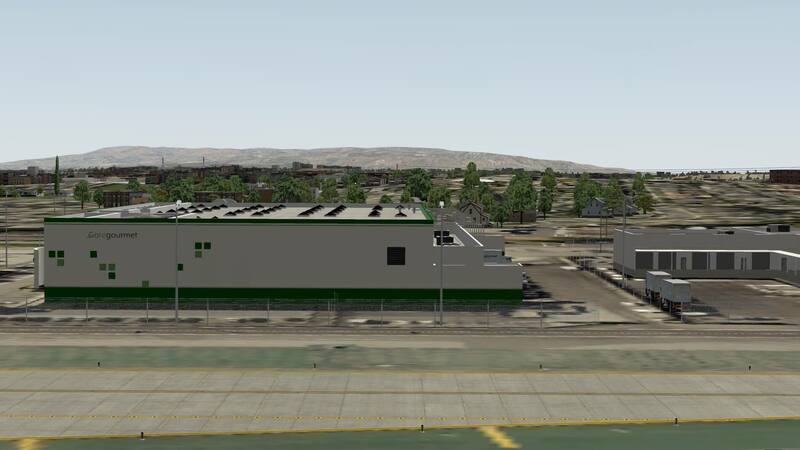 The buildings are well rendered and you can easily use this as base for your cargo operations if you are so inclined. 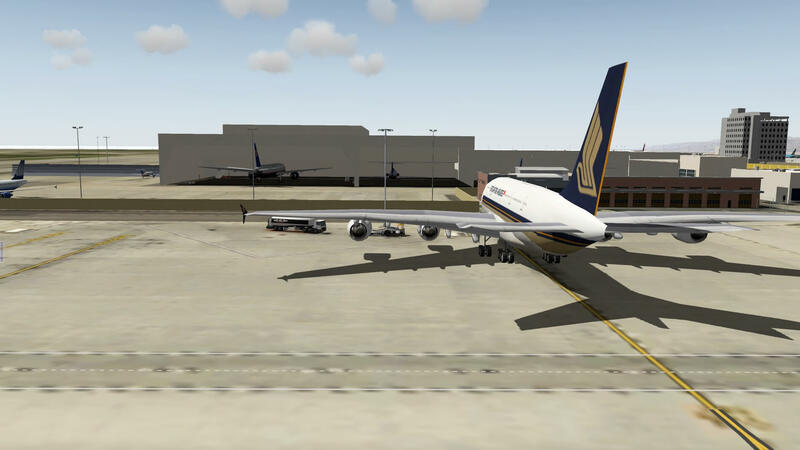 Alongside, we have the Landmark and Atlantic Aviation and then further on, Nippon and Qantas Freight then GateGourmet and Singapore Cargo complete the list. 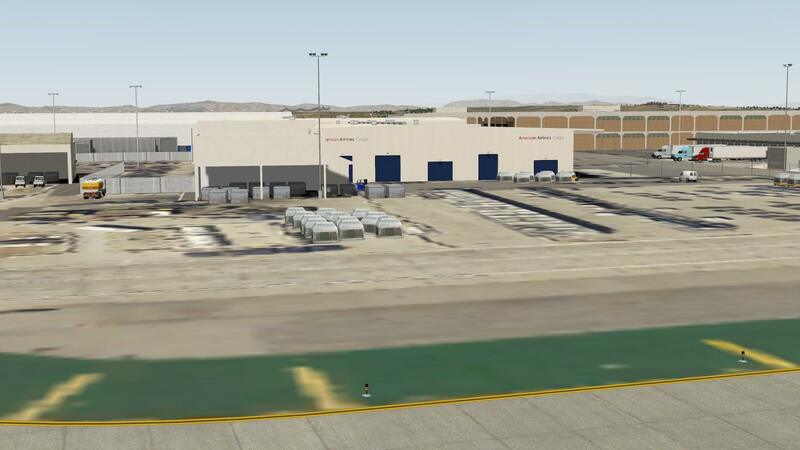 Along 25R, we have more cargo buildings from the B-1 Cargo area. 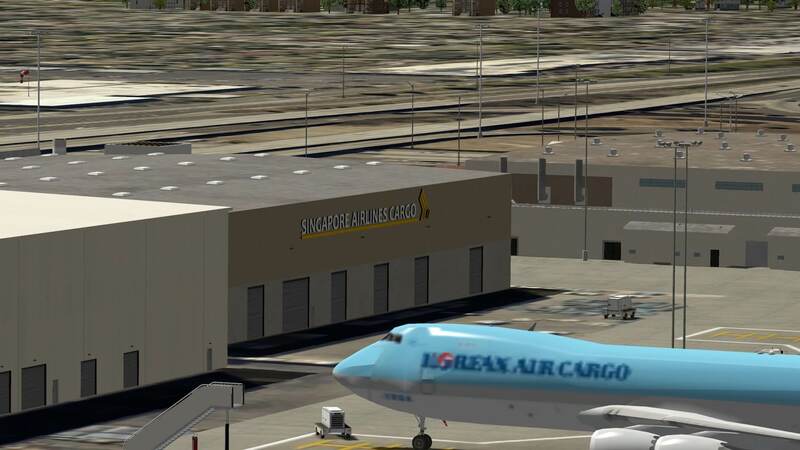 Here, resides Asiana Cargo, American Airlines, and United. 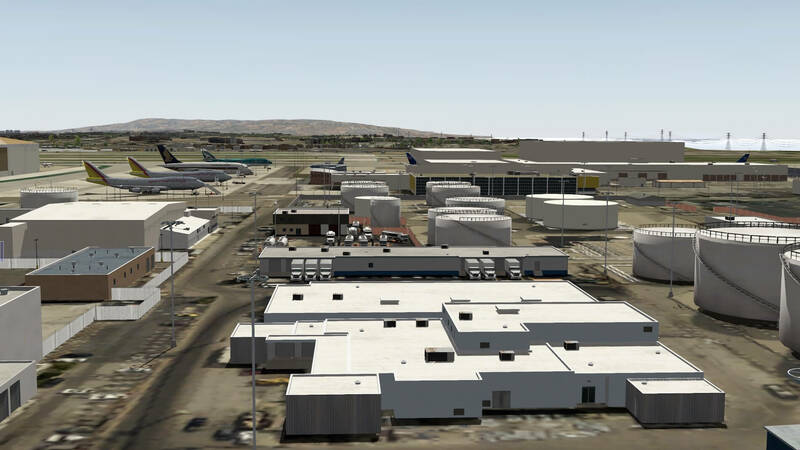 There are a lot less planes parker here than in the Imperial Cargo Complex, but I guess this means more flights from your own cargo aircraft should you choose to fly from here. 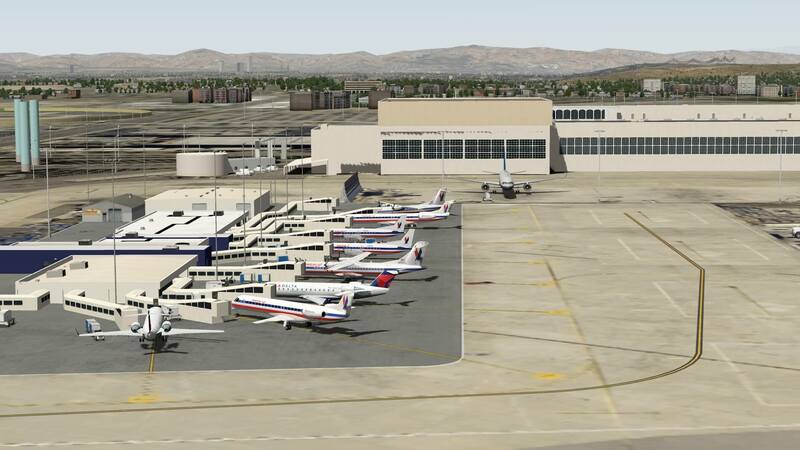 Along C5, we have the Delta/American Eagle known as the AE terminal, with a host of CRJ and ATR aircraft populating the gates. 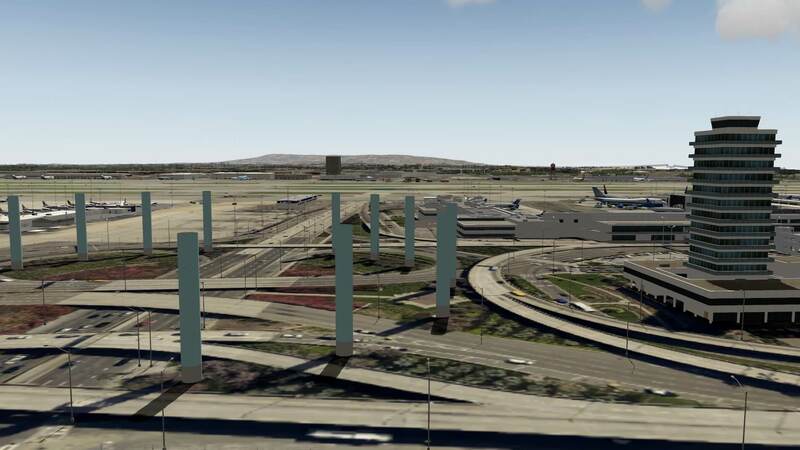 You can see below, that the developer has given the illusion that there is a bridge over the taxiway, where the Kinetic Light system is situated, which I found quite convincing here. 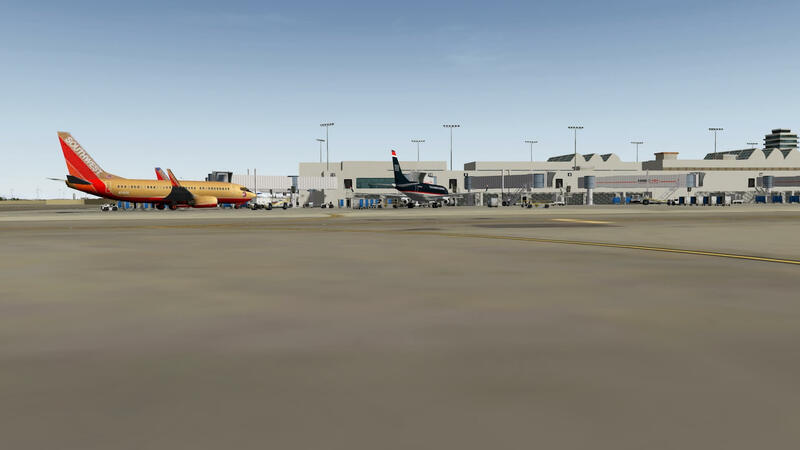 Not quite the same approach that I’ve seen in Aerosoft’s sceneries, but it works nonetheless. 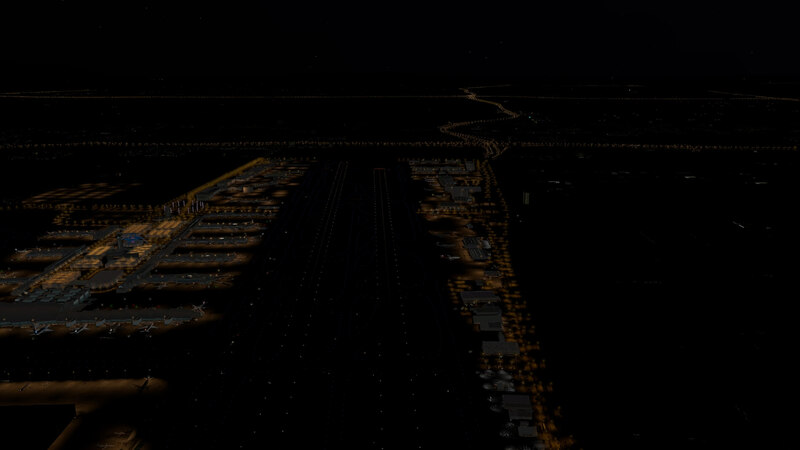 Especially at night, which I’ll come back to later on. 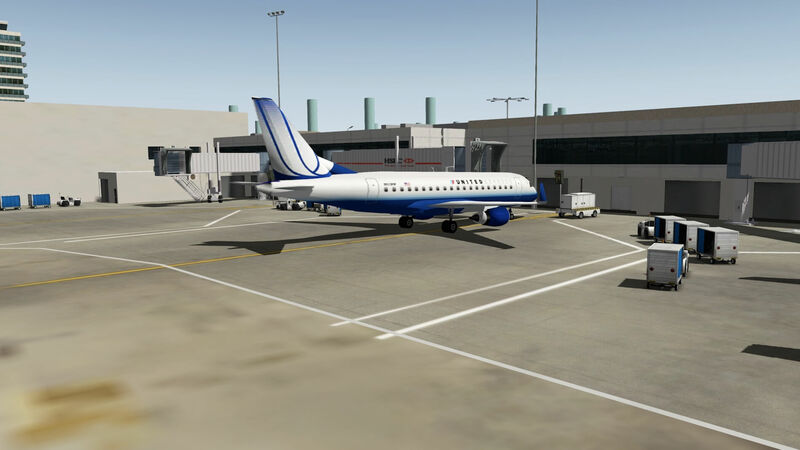 Next, we come to the first of the passenger terminals, in this case, terminal 8 and 7, which covers United and United Express Airlines. 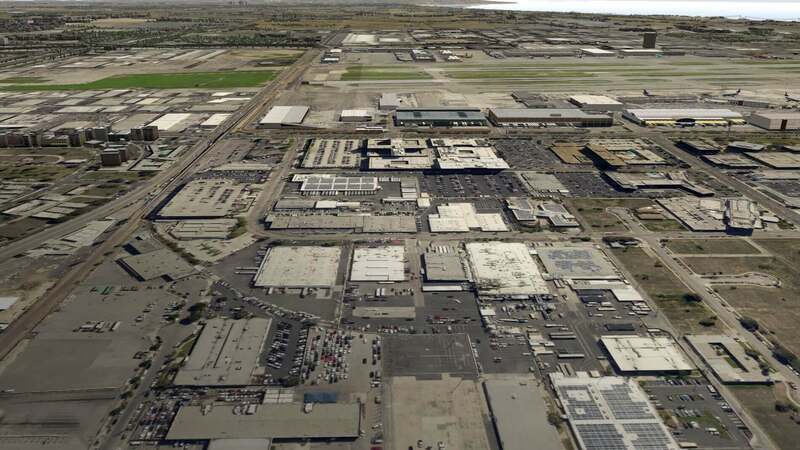 These were both built in the early 1960’s, and expanded in the 70’s and 80’s as the need arose. 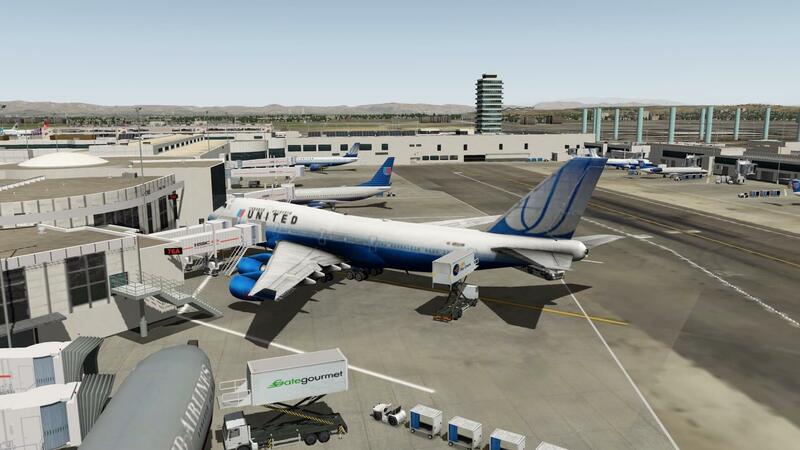 The developer has done some nice work on the United Aircraft, with a mix of old and new logos. 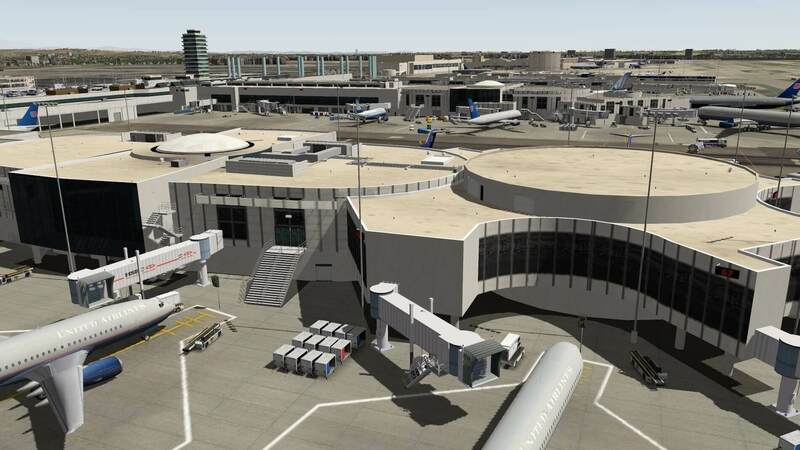 From the photos, I have seen on the net, the buildings look pretty much the same and are a very good rendition of the actual terminals. 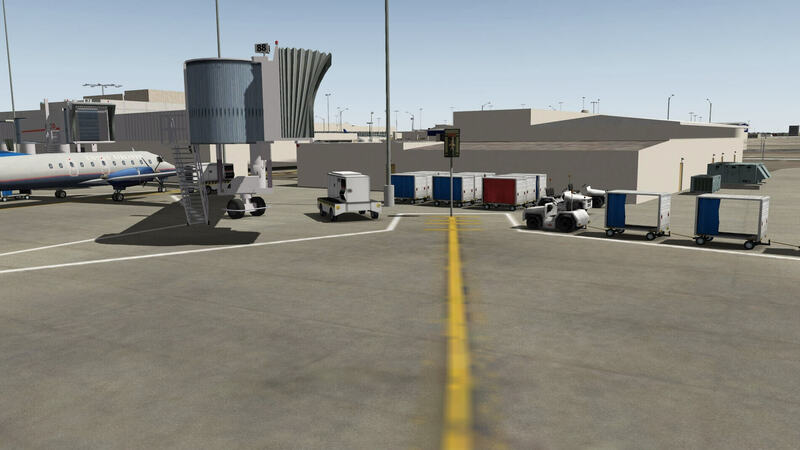 All the terminals have plenty of baggage carts and gives the impression of a very busy airport, which it is in reality of course. 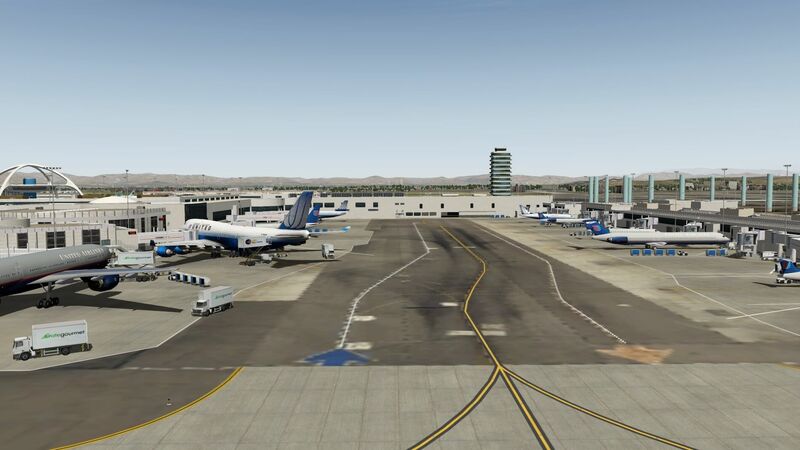 Terminal 6 for some reason has gone back in time to the 1980’s as there is no shortage of Boeing 727’s awaiting to take passengers to their destination. 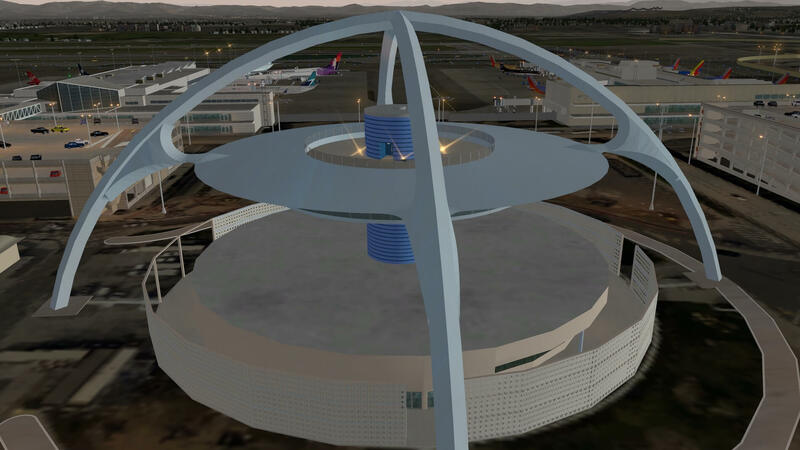 This was also built in the early 60’s and expanded later as demand for air travel rose in the 1970’s with the advent of cheaper air travel. 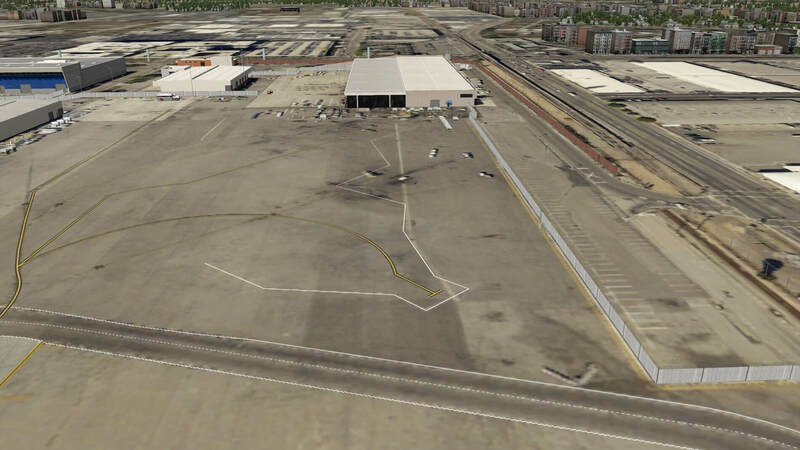 From the similarity to terminal 7, I can guess that these two terminals were built around the same period. 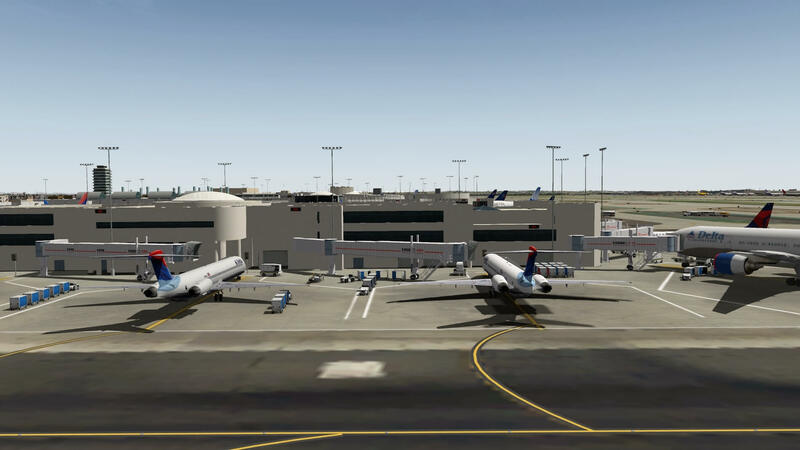 Terminal 5 is the Delta Airlines stop, and this again has a wide variety of aircraft at the gates. 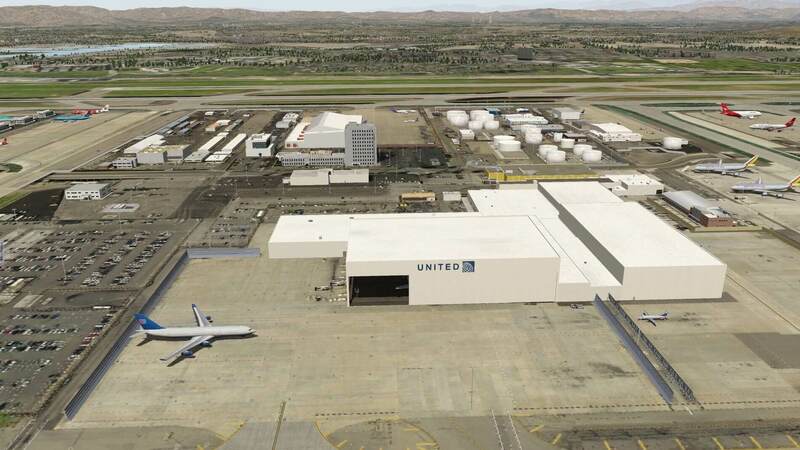 Built again in the early 1960’s it was originally the Western Airlines main terminal until they merged with Delta in 1987. 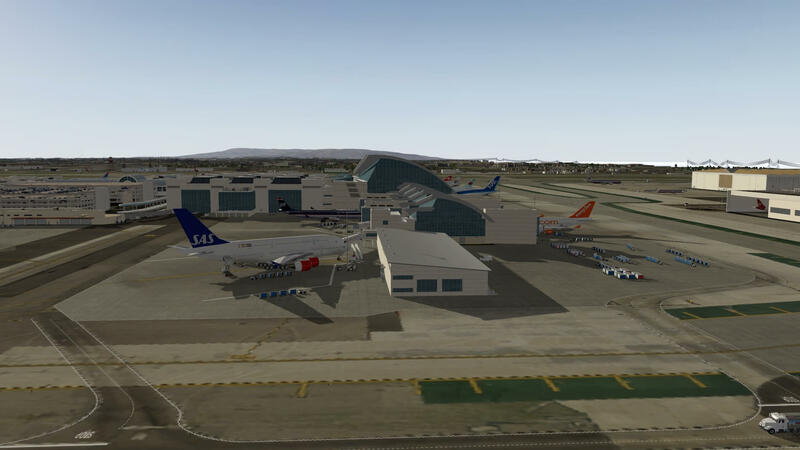 As with the other terminals, these are Autogate equipped which adds more features to the airport. 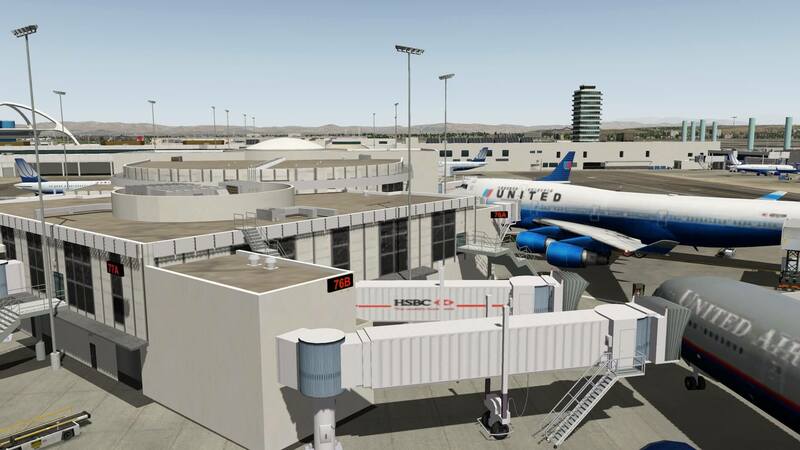 This plugin animates jetways and docking guidance systems (DGS) in scenery packages that have been authored using the AutoGate development kit. 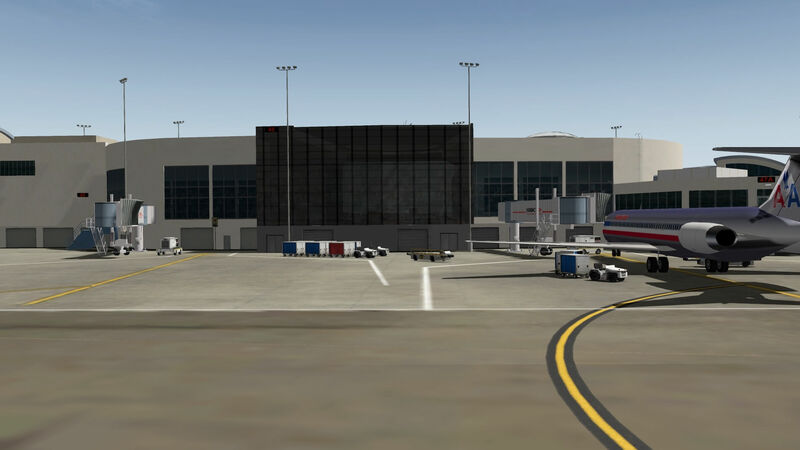 Most addon airports now usually have the facility for this very useful addon, and it is rare now for a package not to specify this as an additional plugin requirement. 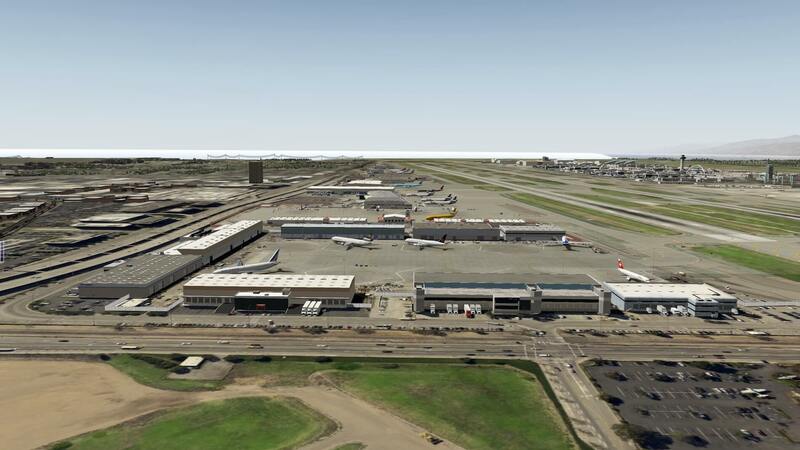 Finally, on the south side, we have terminal 4, which is home to American Airlines. 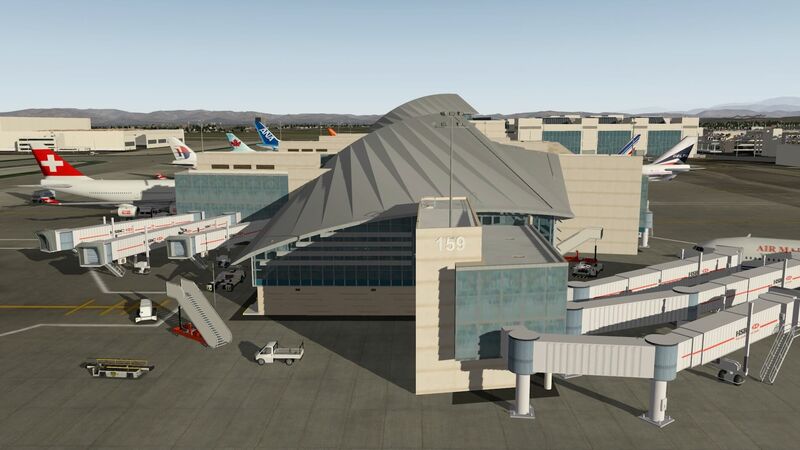 Again, originally constructed in 1961, it has had a major renovation in 2002 which cost $400 Million to improve the appearance and functionality of the terminal. 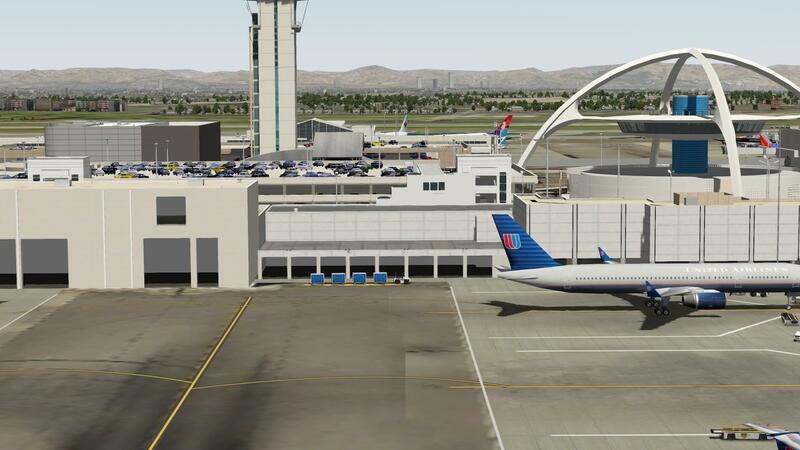 Again, the same features as the other KLAX terminals, this one has a transparent look to the glass to give the impression that there is a glazed look to the exterior. 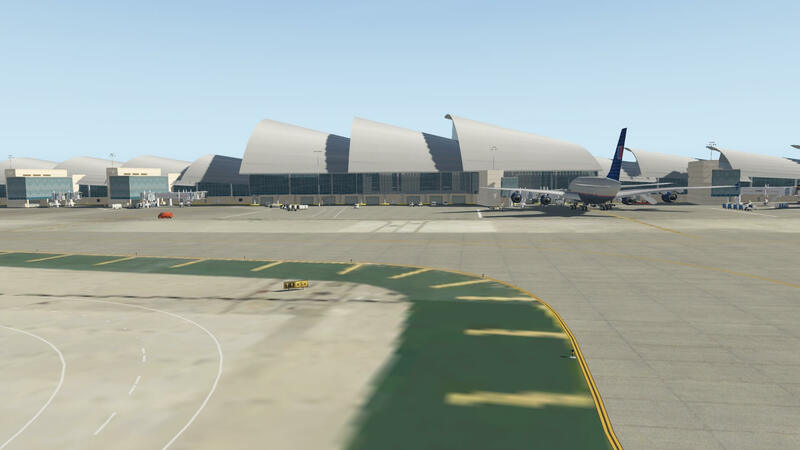 Traveling further west now, we are at some maintenance hangars such as FedEx, – I think the FedEx livery is not quite right since the name very cleverly forms an arrow pointing to the right, but the MD-11 aircraft in the hangar have the correct logo as you would expect, – ,United, and US Airways, some extensive fuel-farms, and the Coast-Guard Station, which is a joint military/civilian service which operates 4 Dolphin HH-65’s at the airbase. 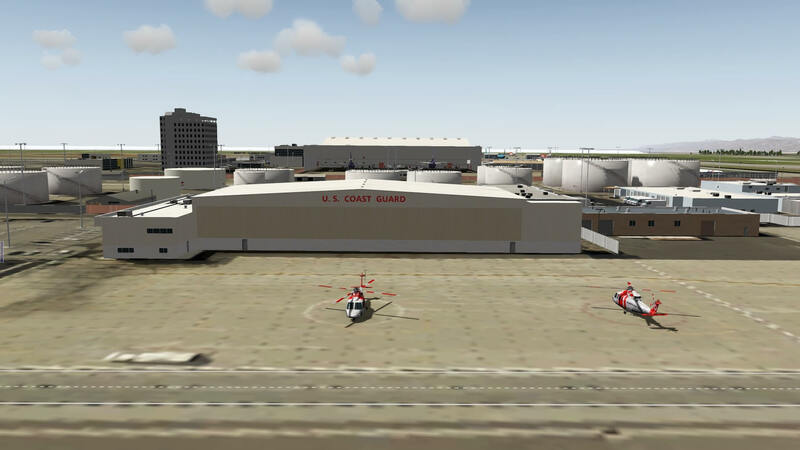 This will cease operations in KLAX and the end of this year and move to Oxnard (KOXR), – and including, of course, the Fire Station for emergencies. It’s actually hard to tell it’s the fire station, since there’s just a brick building and no emergency vehicles to tell if I’m looking at the right building or not, since I can only confirm this by looking at charts from 2006, and a lot has changed since then. Finally as we arrive at the western shore, we have some remote stands known as the West Gates. 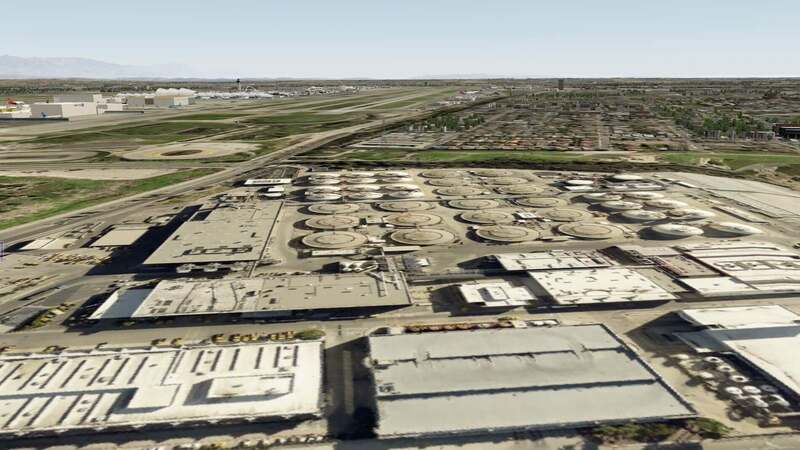 These are mostly used for overflow operations. 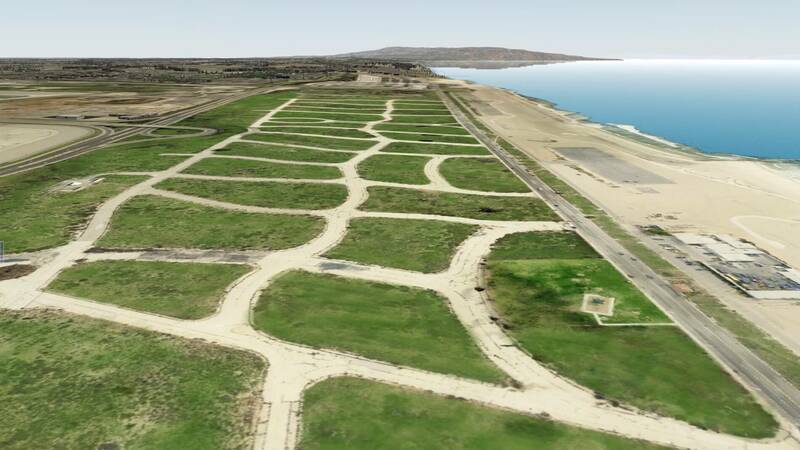 The beaches and surrounding scenery, such as the earthworks around the airport give a good feeling that some construction is in progress. Maybe it won’t be too obvious on approach, but it adds another dimension nonetheless. 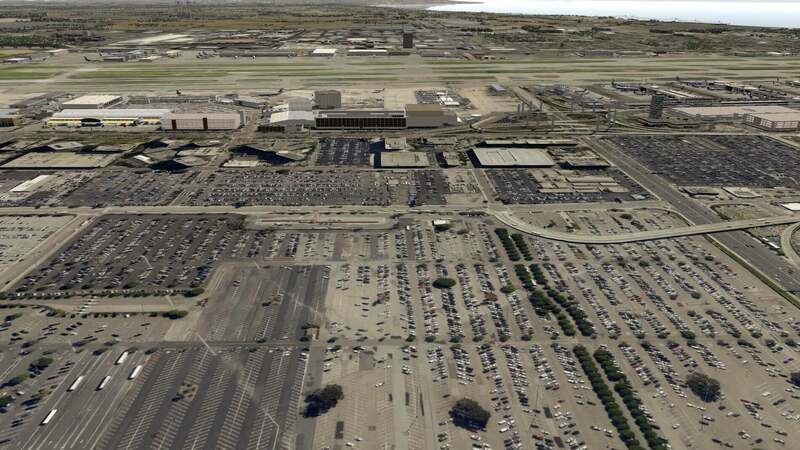 Between each of the terminals, are the main multi-storey carparks and they are squeezed between every available space you can find. 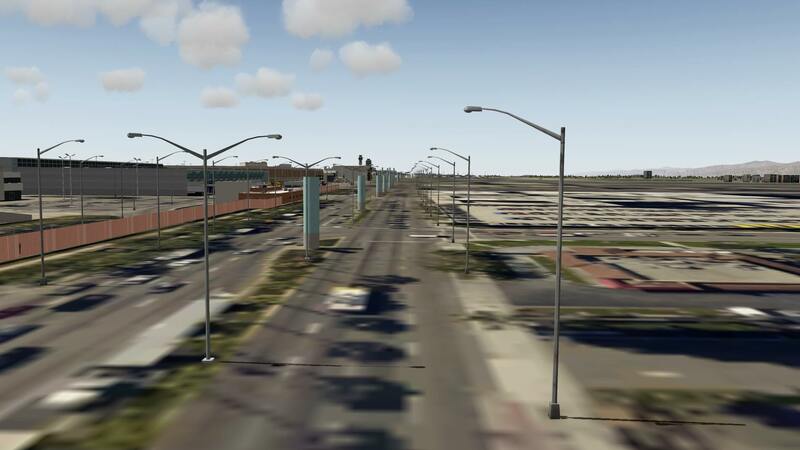 These have 3D cars / vehicles. 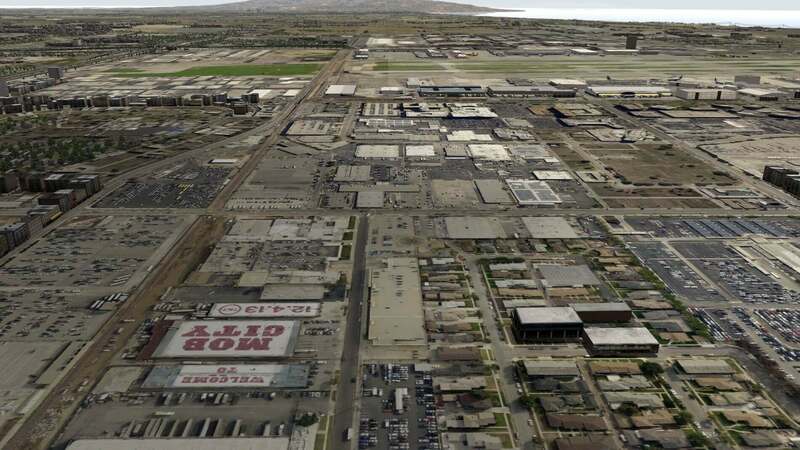 Among the more interesting tidbits in the external car parks, is the “Welcome to Mob City” advertising – a TV series from 2013 which you can see on approach to runway 24L and 24R. 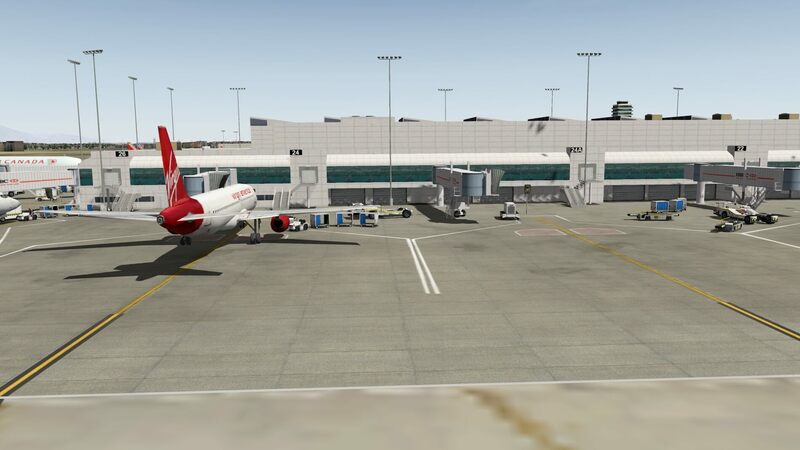 Next we’re back visiting the passenger terminals again, starting with Terminal 3. 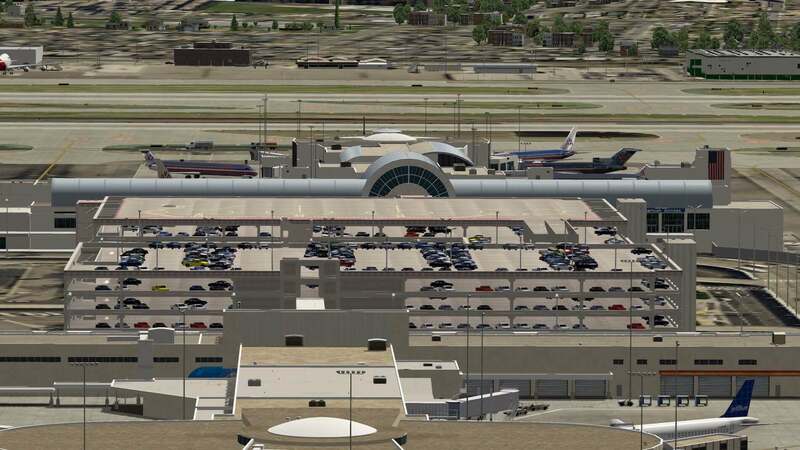 Back in the 60’s when this was built, it was the original TWA airlines terminal, and expanded to accommodate the wide-body aircraft which arrived in the late 60’s and early 1970’s. 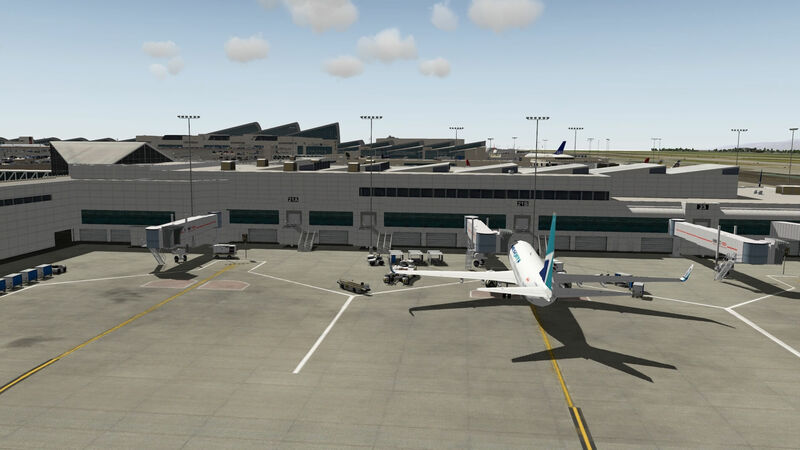 At present, Allegiant JetBlue, Frontier and Virgin America are residents of Terminal 3. 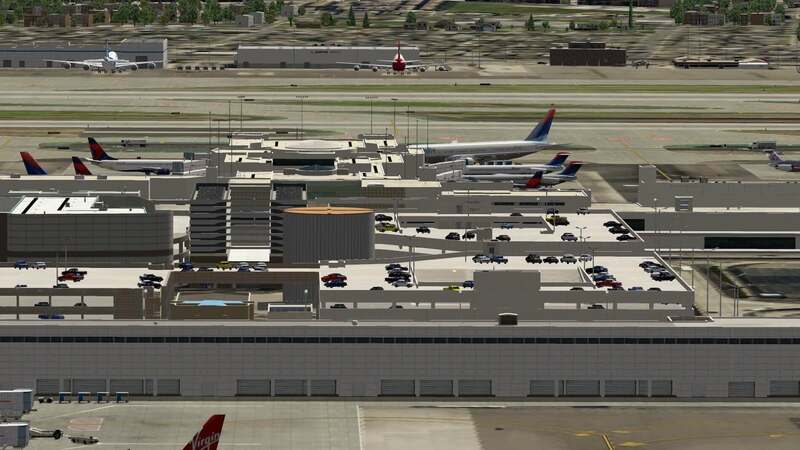 Terminal 2, also built in the same year as terminal 3, was also the main terminal for TWA, which gives you some idea of how large this airline was. 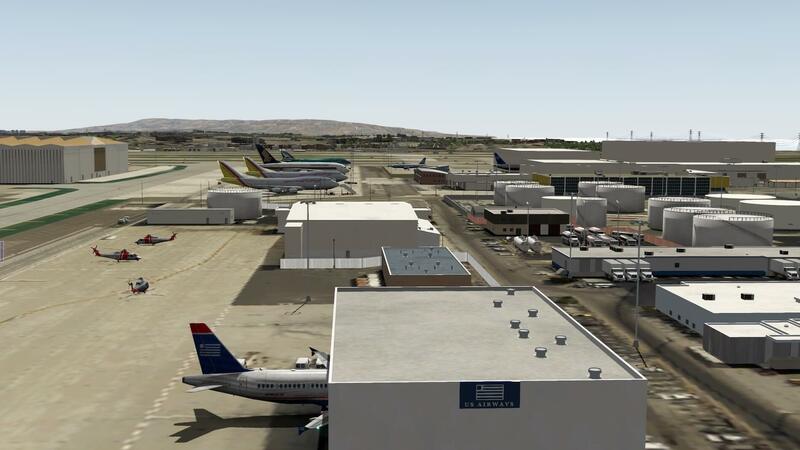 Other notable users were PanAm and Northwest Airlines. 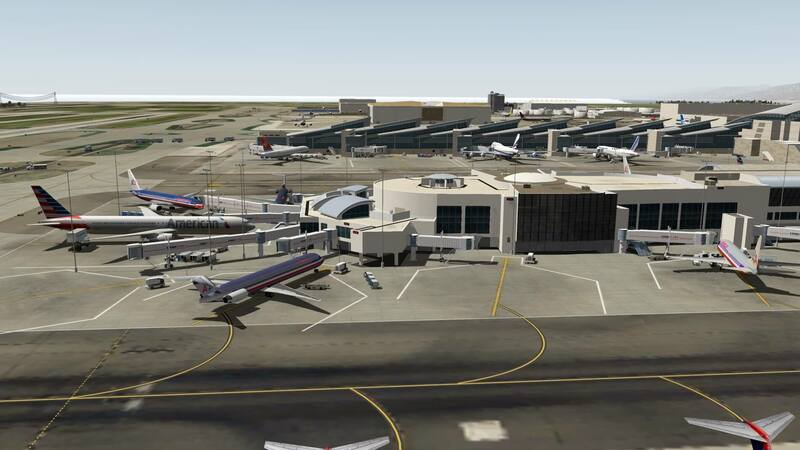 It was the original international terminal until it was renovated and rebuilt which took 5 years in the mid 80’s at a cost of nearly $100m. 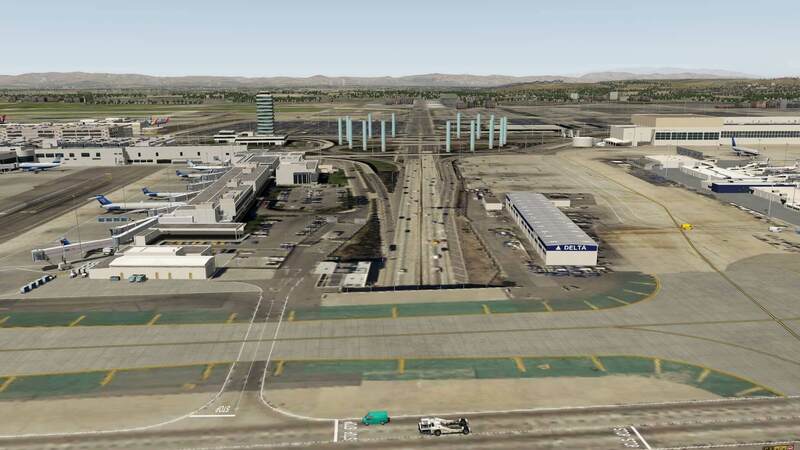 It’s mainly a home to international aircraft not using TBIT, so there is a legacy of foreign airlines using this terminal even now. 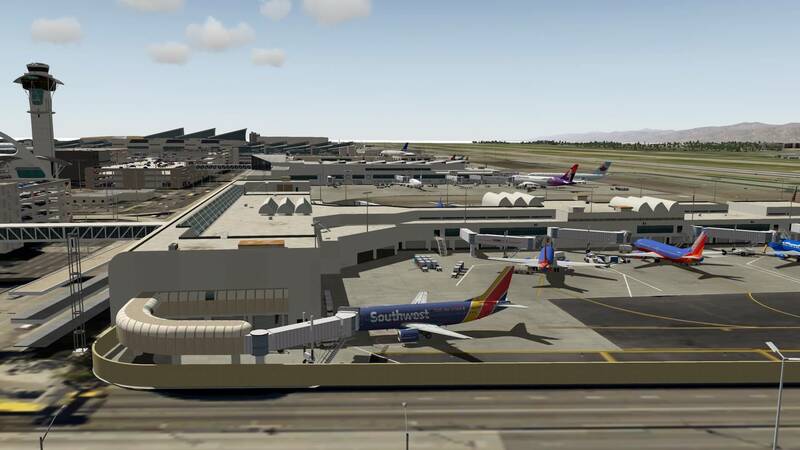 Lastly, terminal one, which has 15 gates, is mainly populated by Southwest airlines, and the airline themselves are financing a renovation of the terminal which was built in 1984. 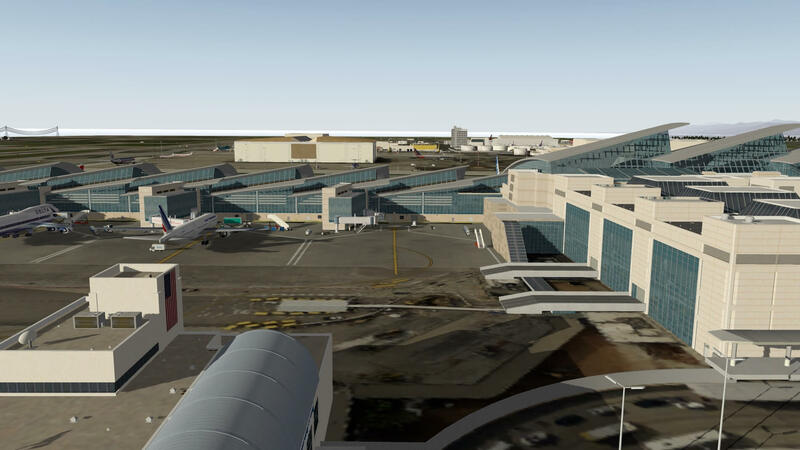 The rebuilding is due to be completed by 2018 and will have updated security screening areas and baggage handling facilities. 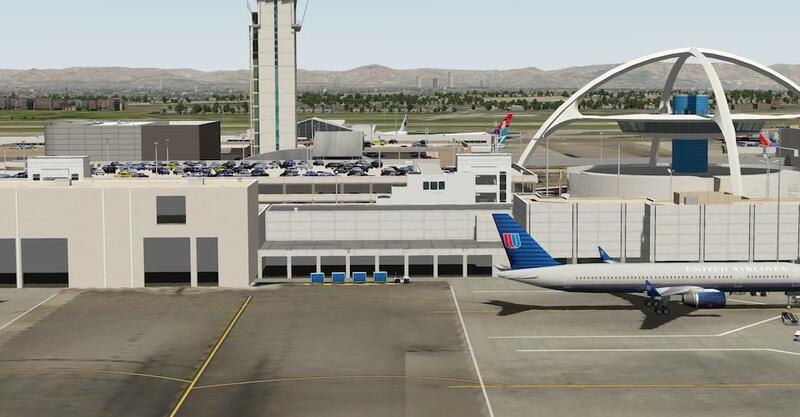 The most notable feature of KLAX is probably the Theme building built in the 1960’s. 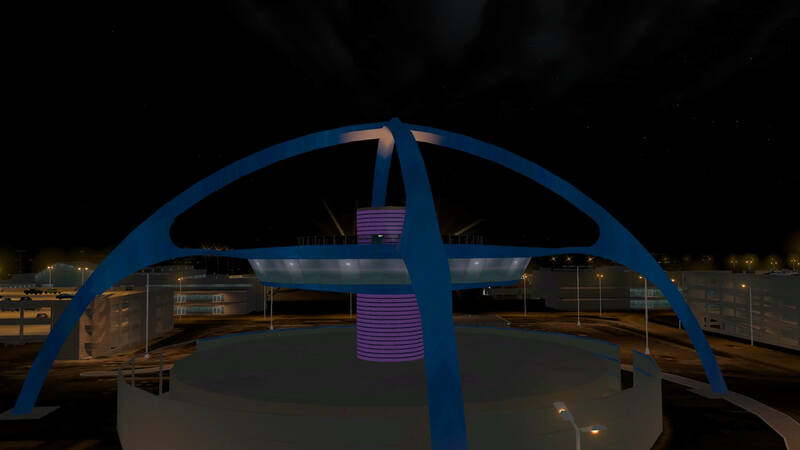 It resembles a flying saucer and was originally designed to be a central crossway for all of LAX’s terminals. 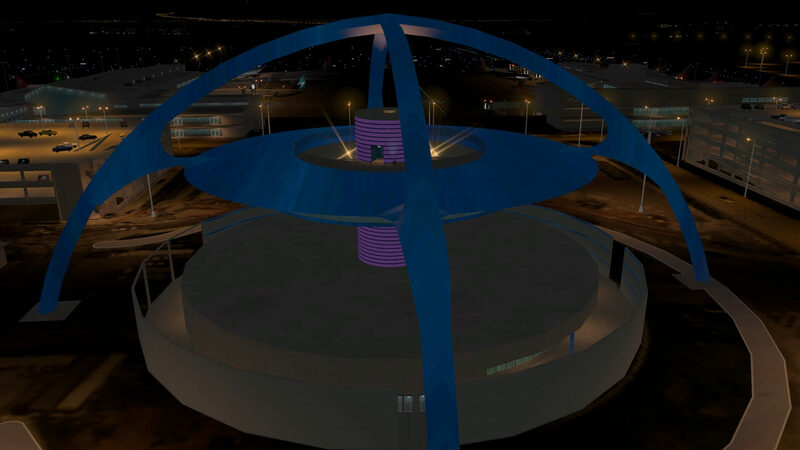 It was scaled down from the original design, and the restaurant at the top was originally rotated slowly at 360 degrees. 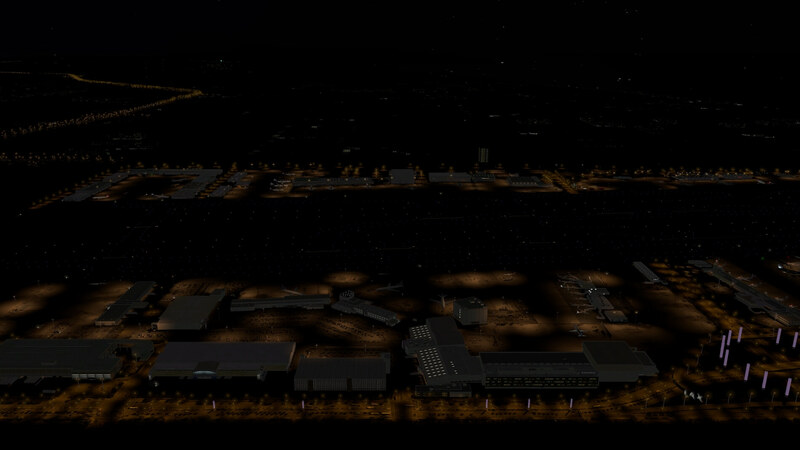 At night, you can see that FunnerFlight have included a feature which shows the Theme building being illuminated, which I think is a pretty cool feature. 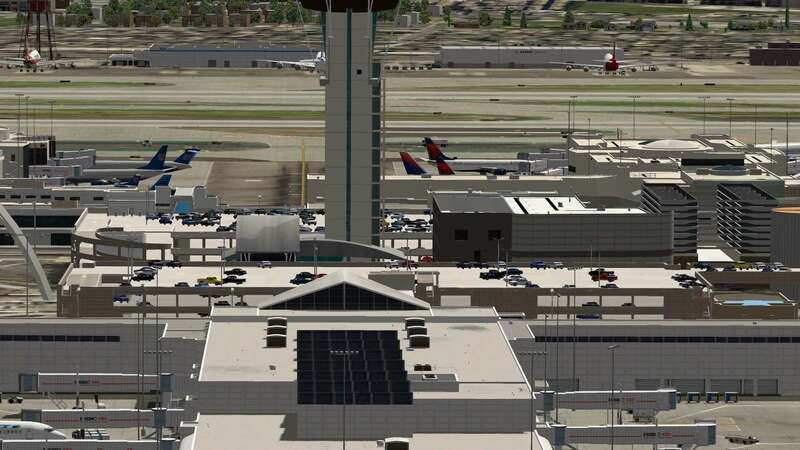 Of course, no airport can operate without a control tower, and again, LAX has a most distinctive feature. 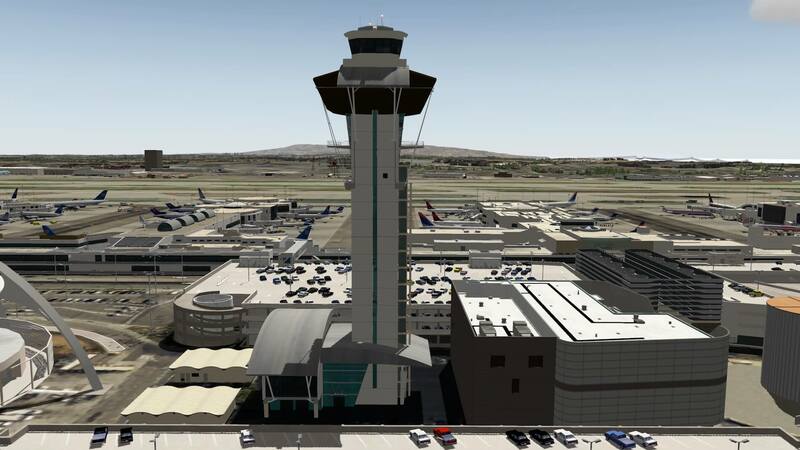 The present tower, began operation in April 1996, is 270 feet or 82+ meters tall. 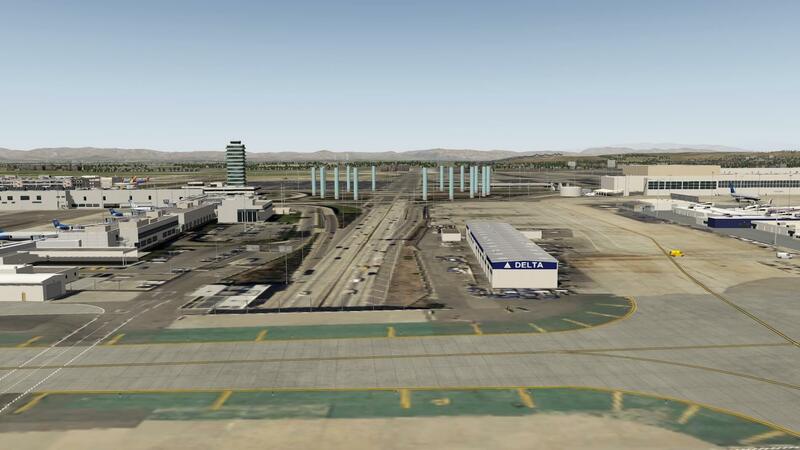 It replaces the older tower constructed in 1961 and is now the Clifton A. Moore Administration Building seen in the picture below, along with the prominent LAX signage as you approach the airport from Century Boulevard. 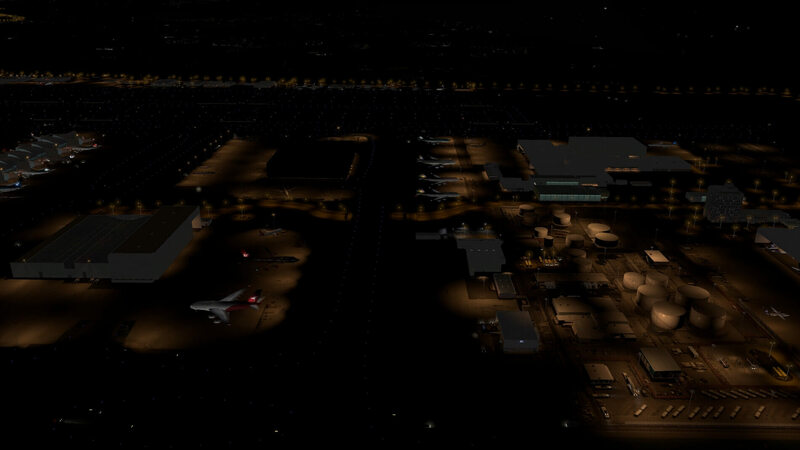 As with all X-Plane airports, I never fail to be impressed by native night lighting, but here, Funner flight have gone a bit further with their KLAX impression. 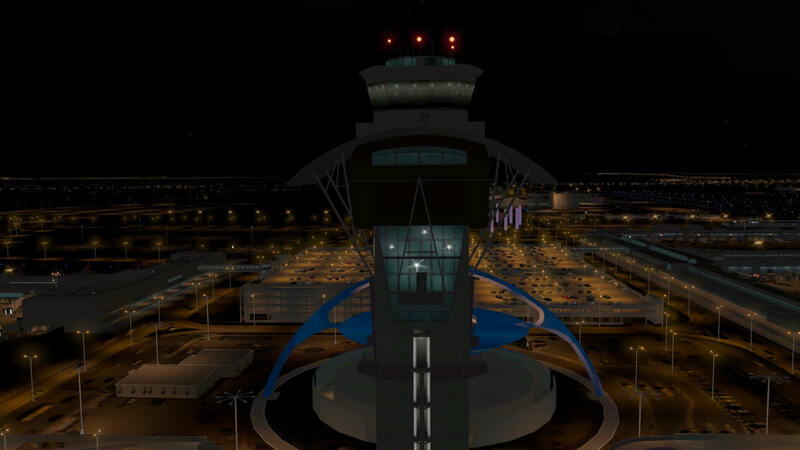 The lighting on the runway is standard X-Plane fare, but what gets my attention here is the Theme building which actually has animated lighting which moves up and down the building. Of course, you cannot see this in screenshots, but you get the general idea. 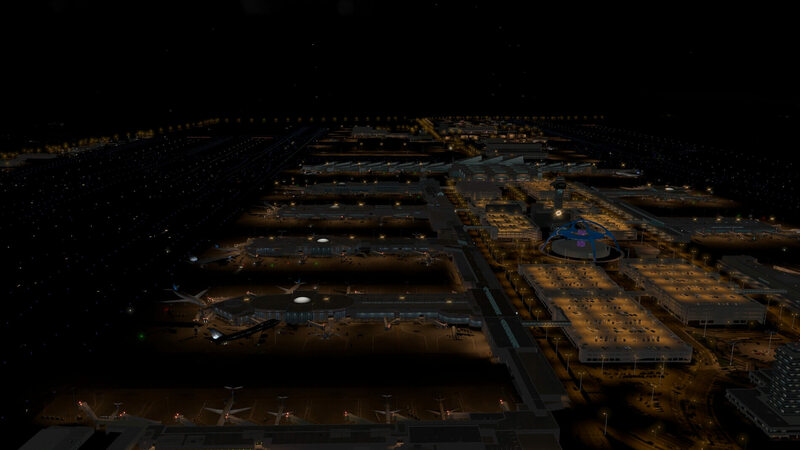 This is a very big airport indeed and the amount of lights being drawn here is impressive. 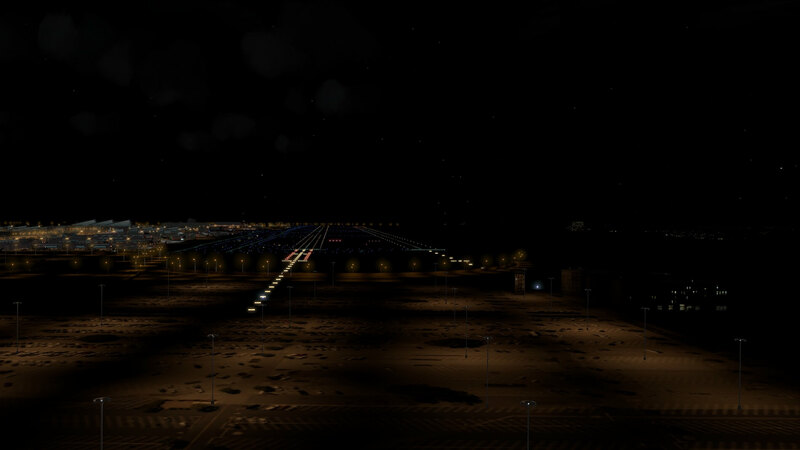 This is quite a large airport and consequently, will be heavy on frames. 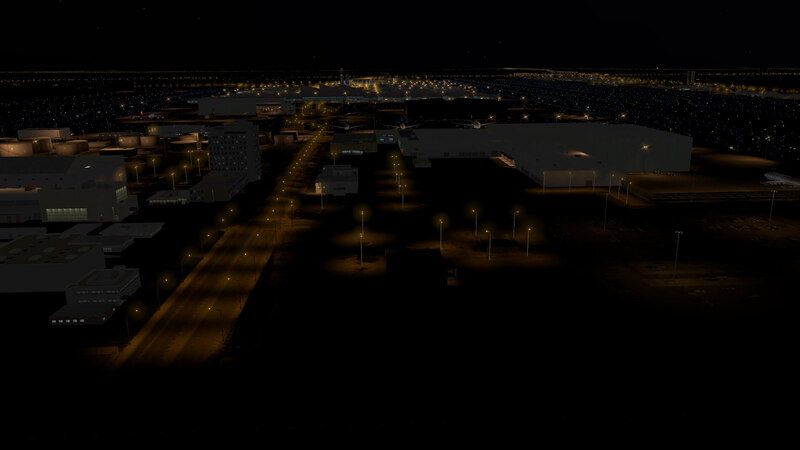 Taking this into account, I lowered my settings from my previous setting of “Extreme Resolution” to “Very High” and this helped considerably. 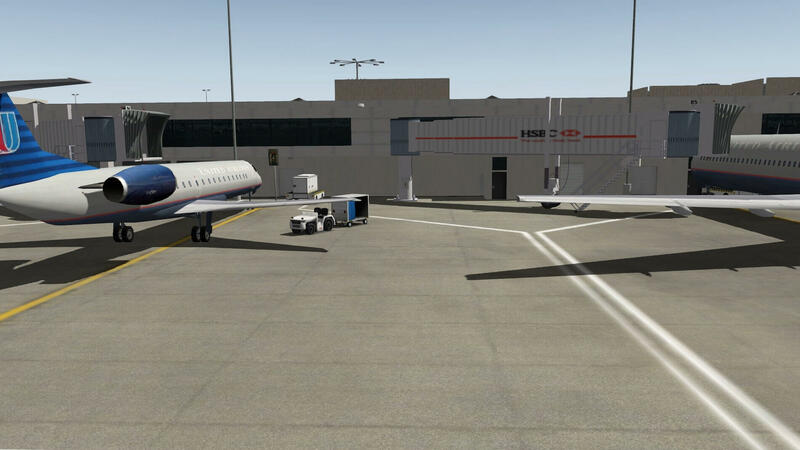 I was able to maintain over 30fps with the IXEG 737, and with the MD-80 from Rotate, I was getting 20-25 fps with my current settings. Bearing in mind that the large file size and the fact that there is photo-real textures included, I thought this was very acceptable. 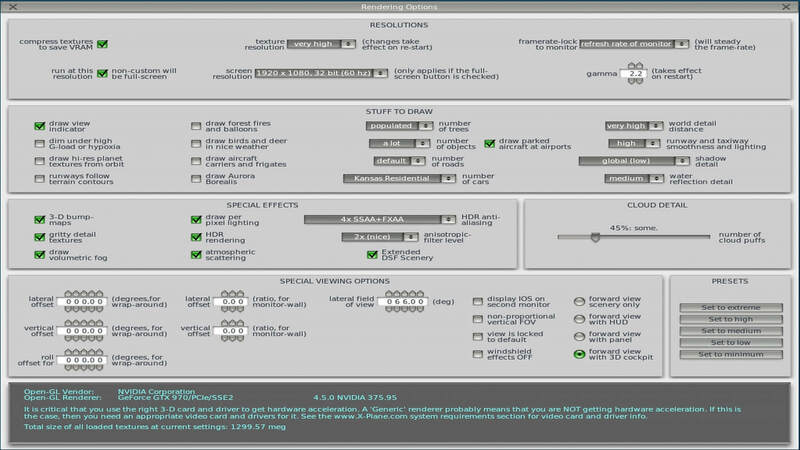 Below, is a picture of my rendering settings for this addon. 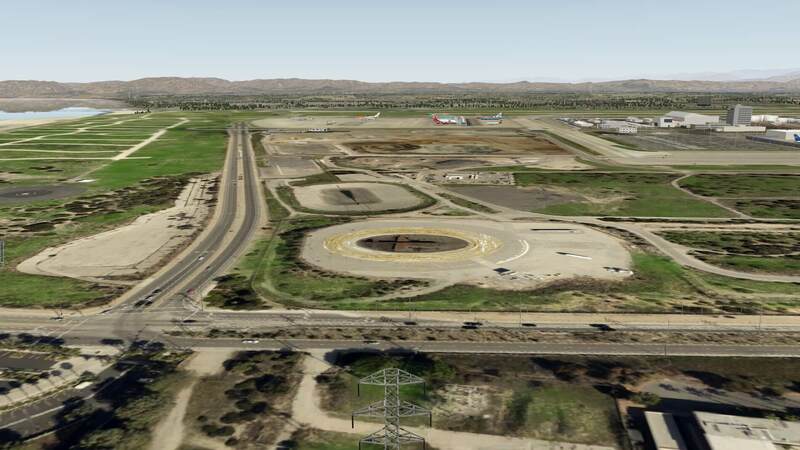 Wow, well as I said at the beginning of this review, this is a large airport, and took some going to get through. 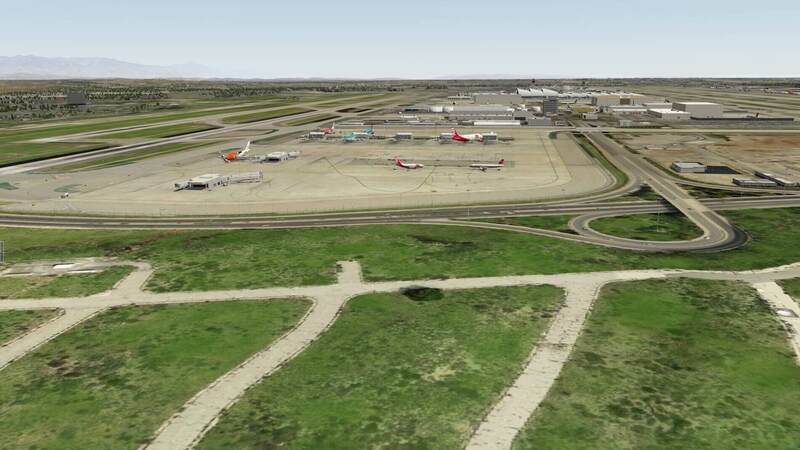 Having said that, this airport is approaching the FS9/FSX look in some respects and a bit more besides. 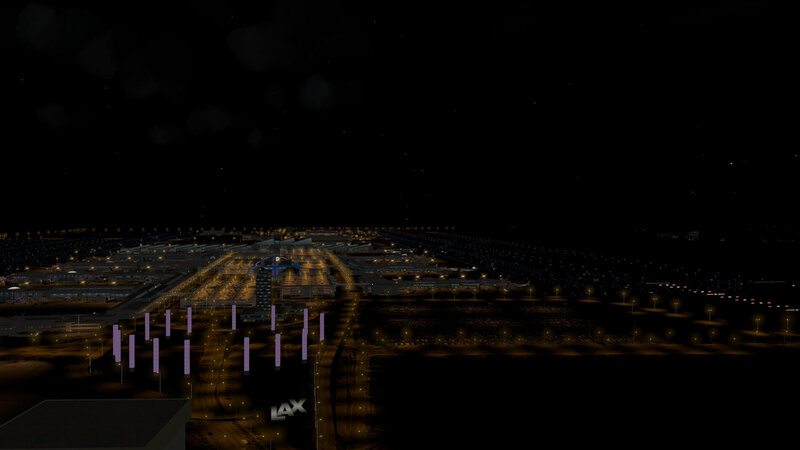 The texture resolution is very high by X-Plane Standards, and without doubt the Theme building is the centrepiece of this product along with the light show included. The Kinetic lights are very well done, although think how good it would be to have the columns changing colour! 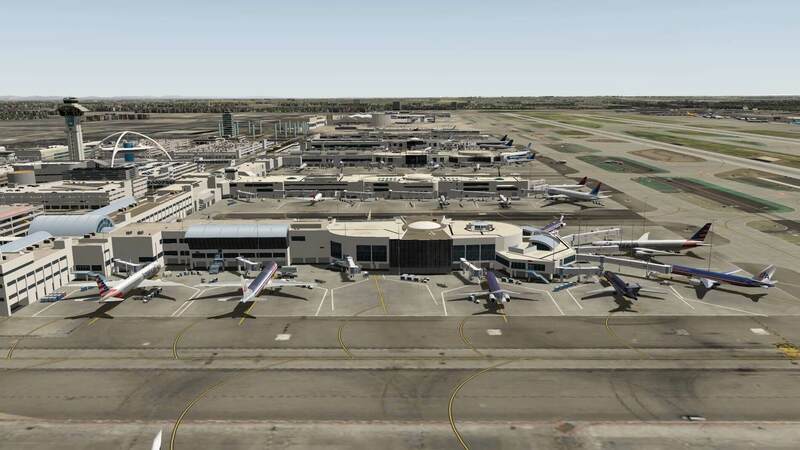 All said, if your system is low to mid end, then download the already excellent MisterX6 KLAX, but if you want that little extra like more accurate rendered buildings removed from the “Legobrick” construction of sceneries, and you want to step up a level in scenery complexity, then I would recommend this product, as long as you have the hardware to deal with this, then by all means, go for it. 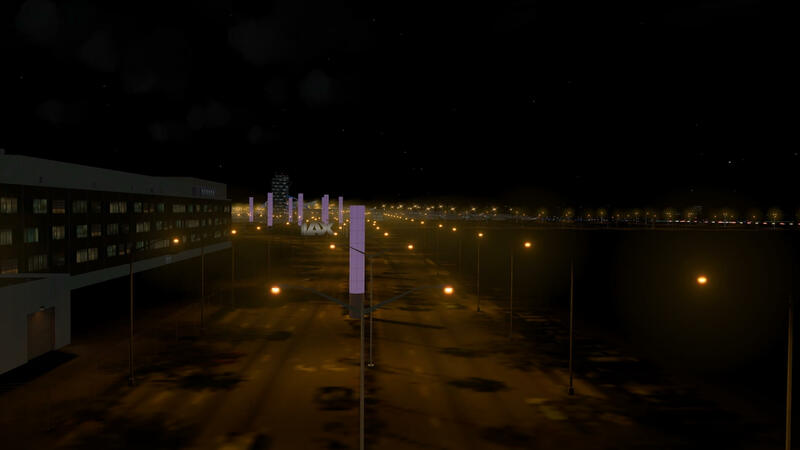 The MisterX6 sceneries as a rule are top of the tree, but this scenery is the next level up. 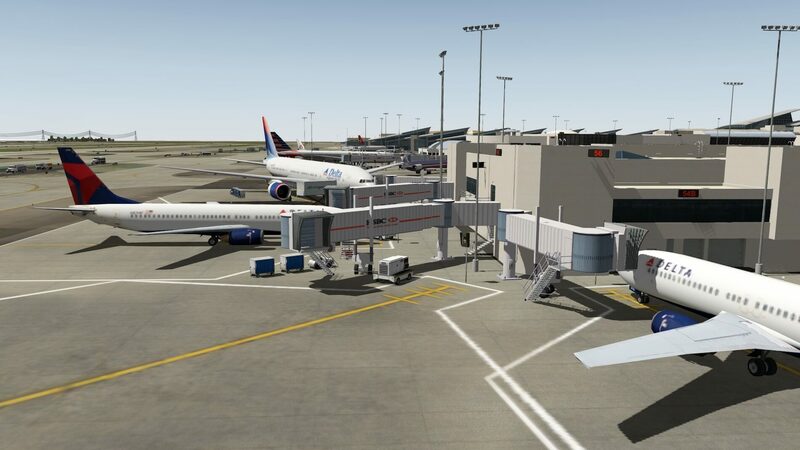 Having said that, I do wish payware developers would look at sceneries which are not already being dealt with by our already talented pool of freeware developers, such as KIAD or CYUL or CYVR. 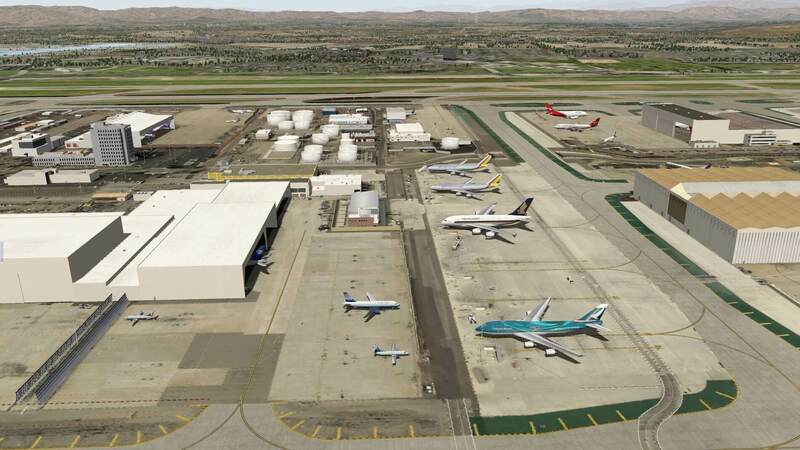 With more and more customers discovering X-Plane, I think the market will get bigger and more offerings from commercial add ons can only be welcome. 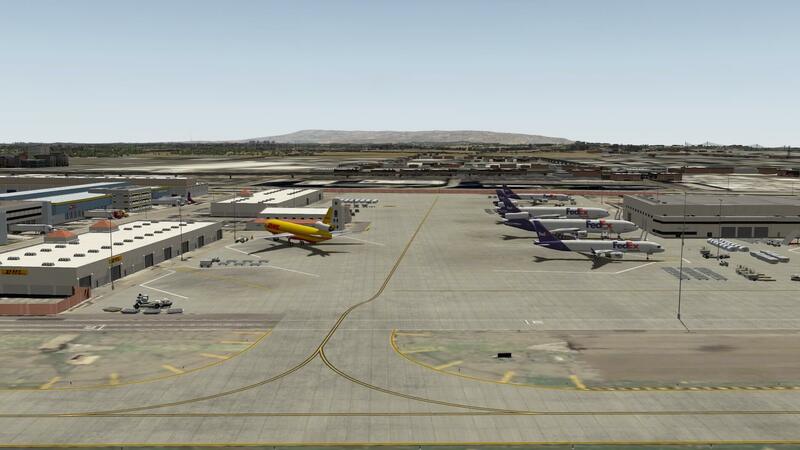 The price of this add-on is currently 24.95 USD and you can get it at the dedicated X-Plane.Org web shop page.